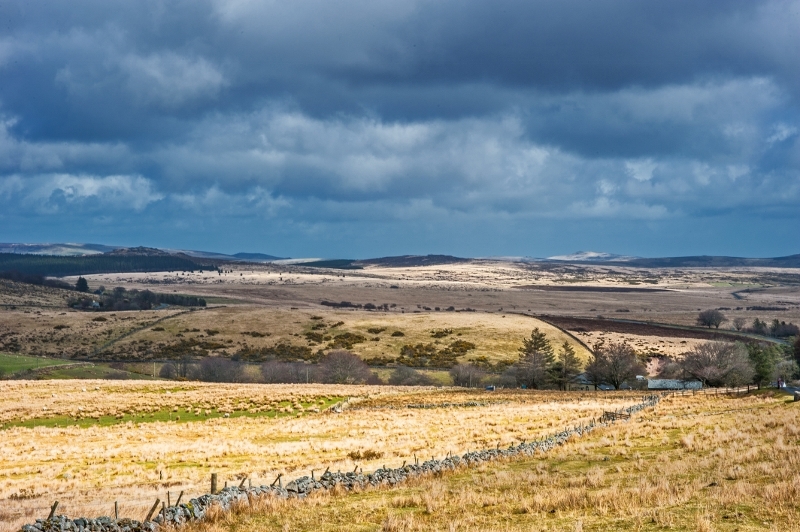 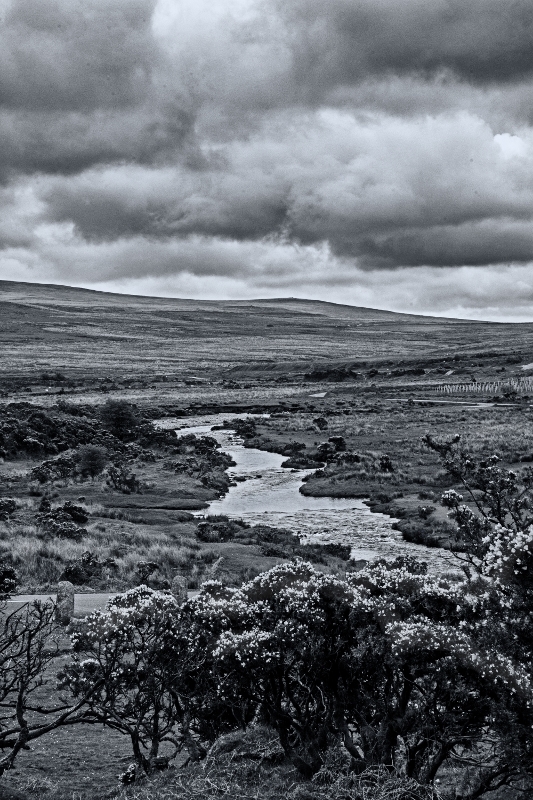 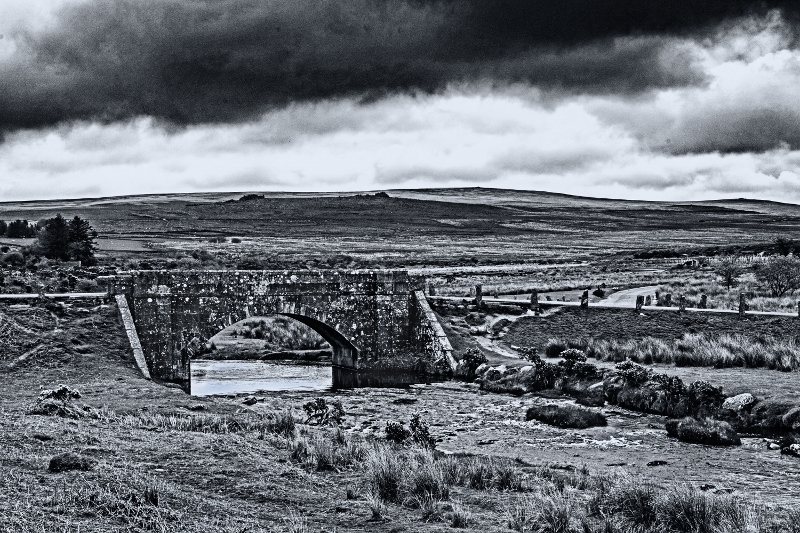 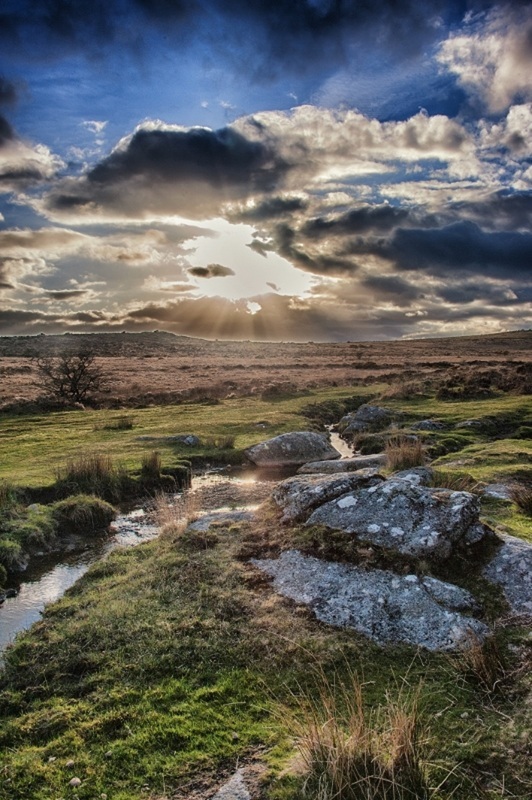 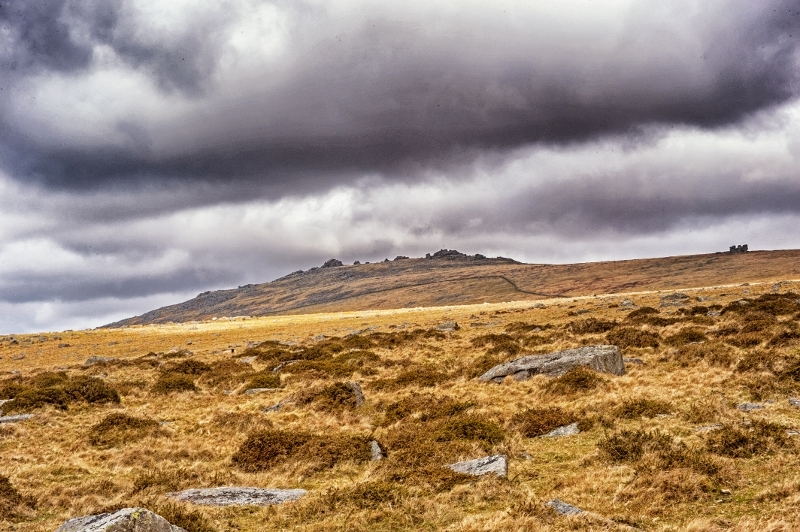 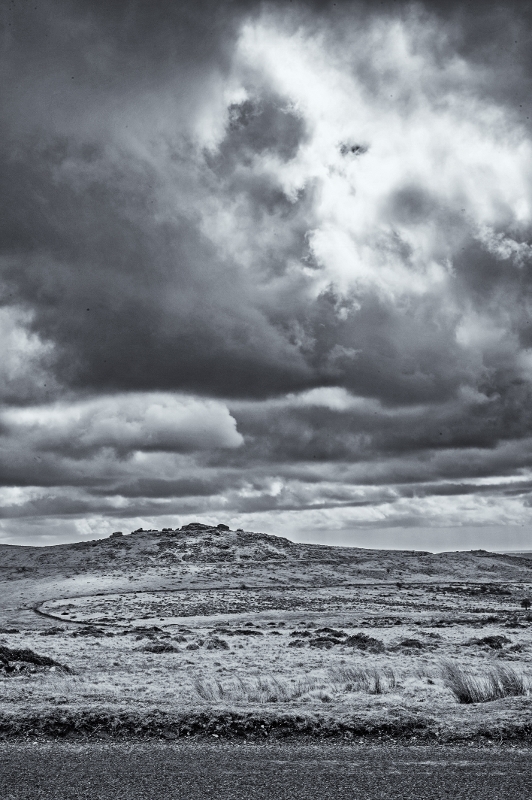 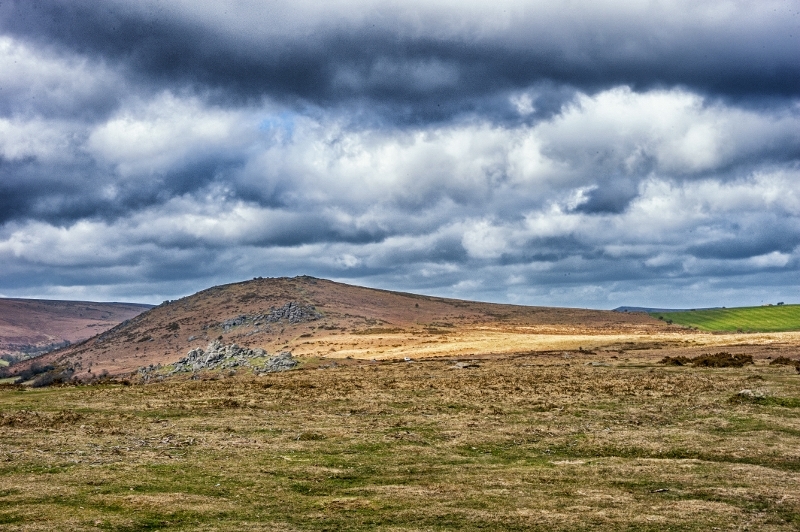 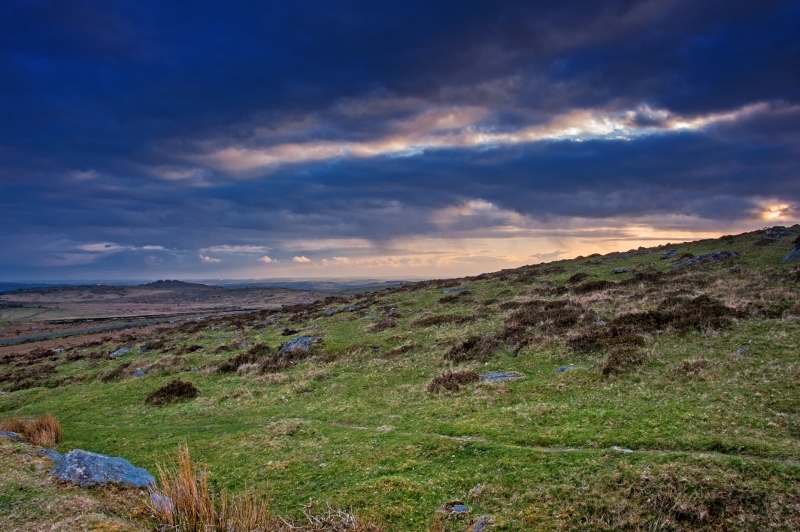 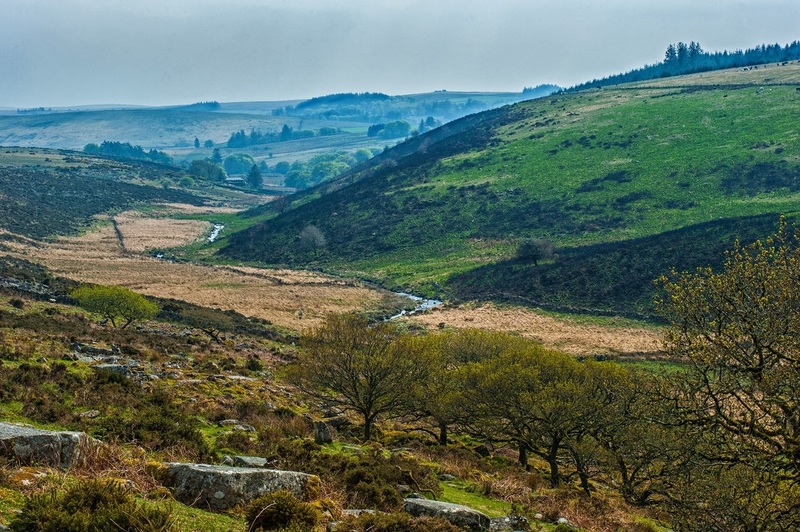 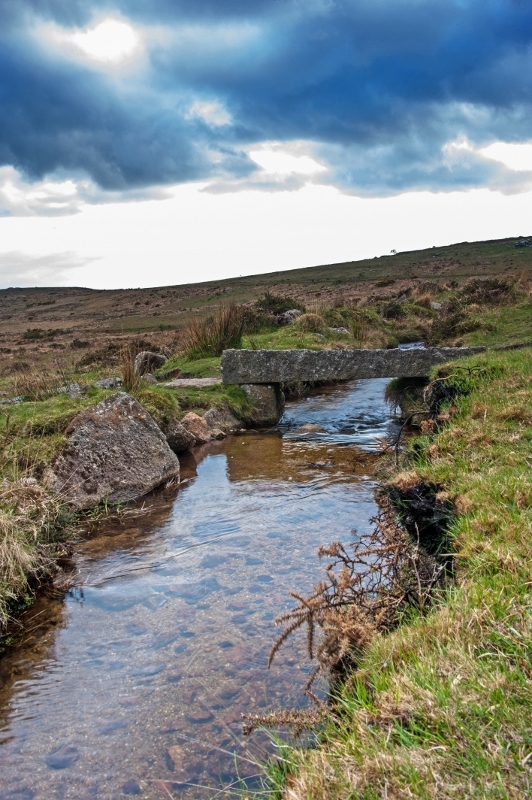 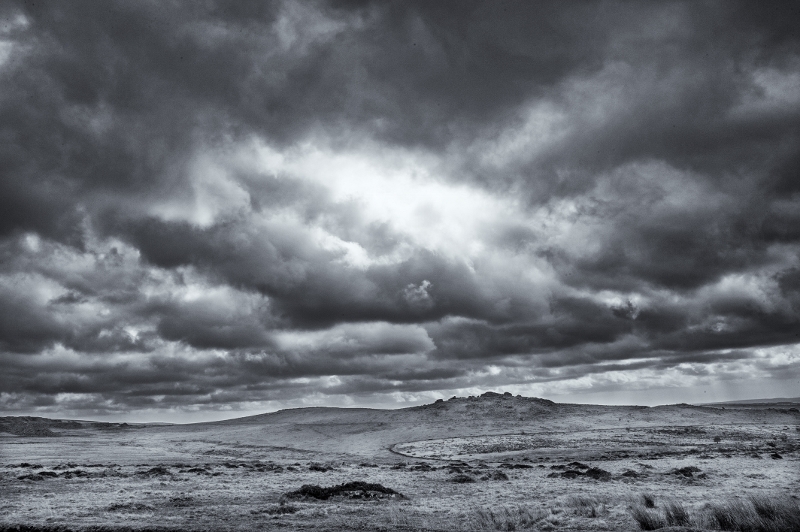 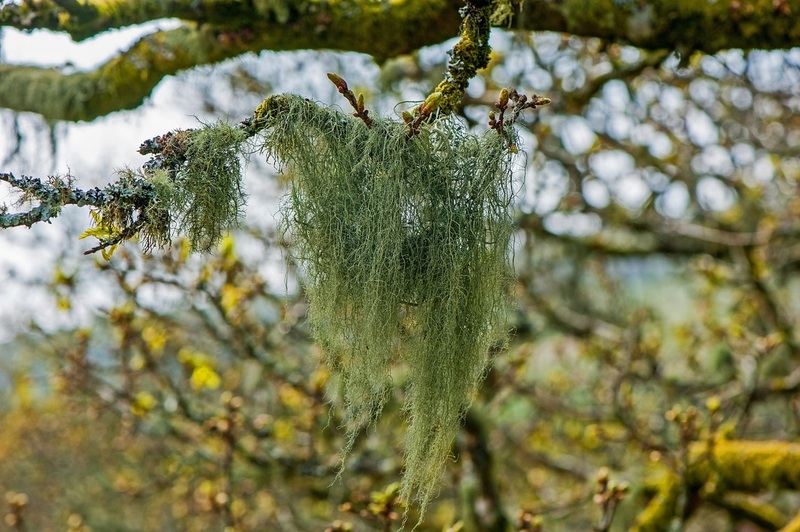 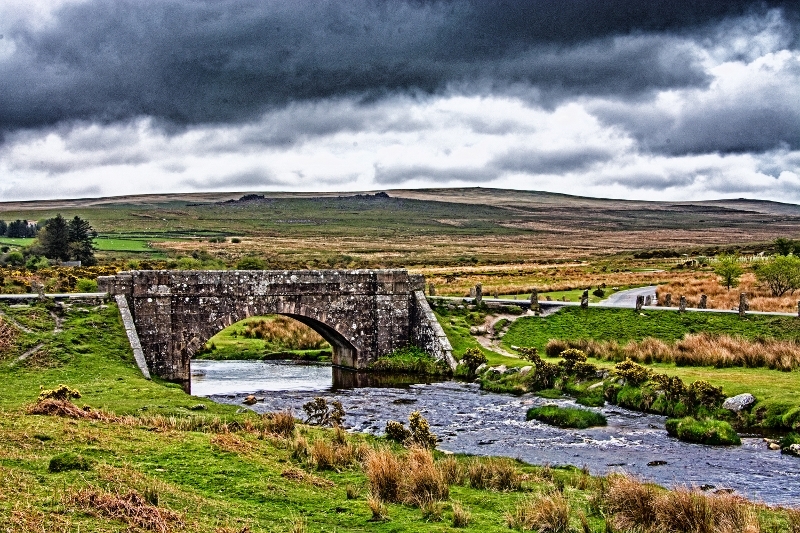 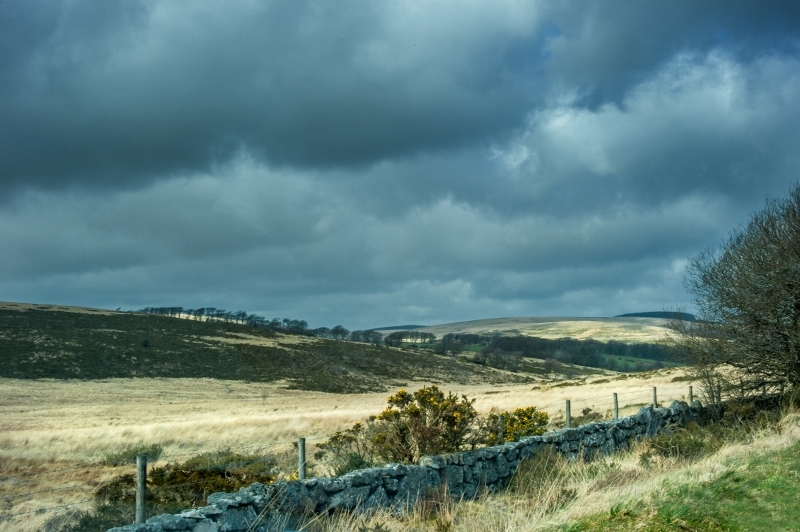 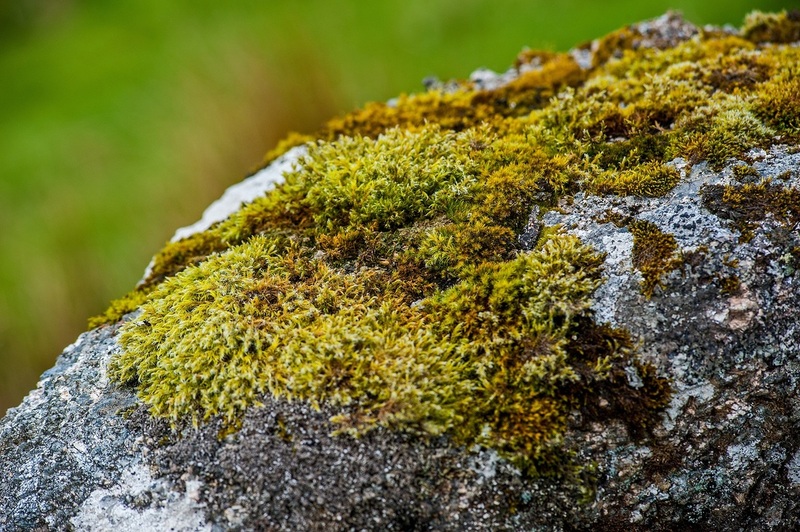 Dartmoor looks like a wild, unspoilt landscape but it is a land that was farmed in prehistoric times until the weather got colder and wetter. 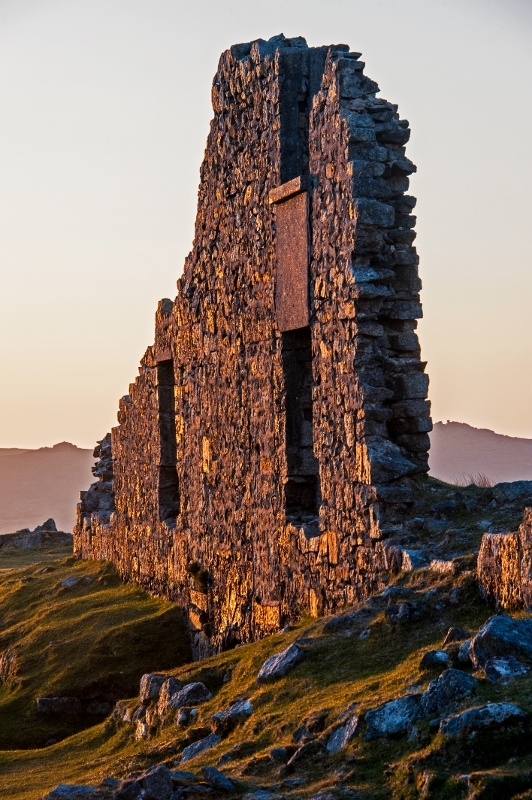 Later came some industry like quarrying and forestry. 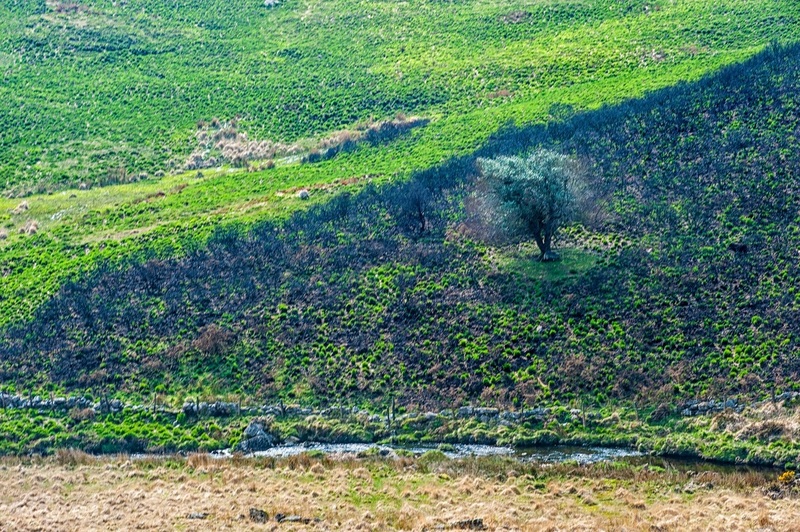 Today the forestry remains and farming is mainly limited to sheep farming. 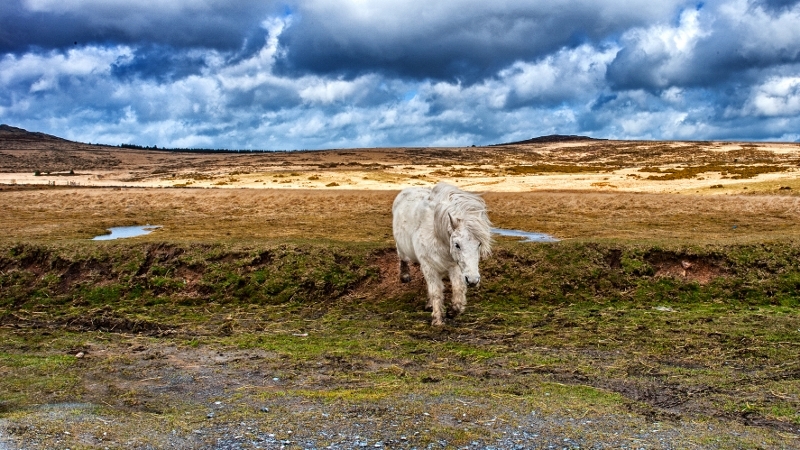 Ponies are owned but allowed to graze free on the moor. 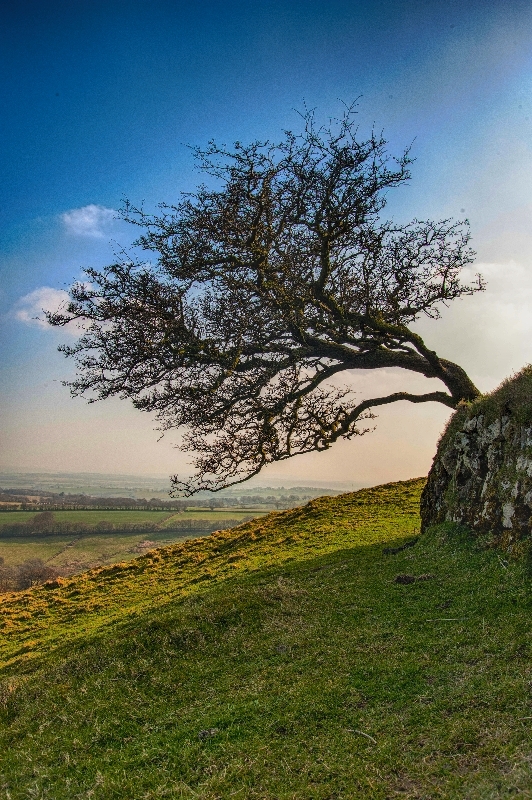 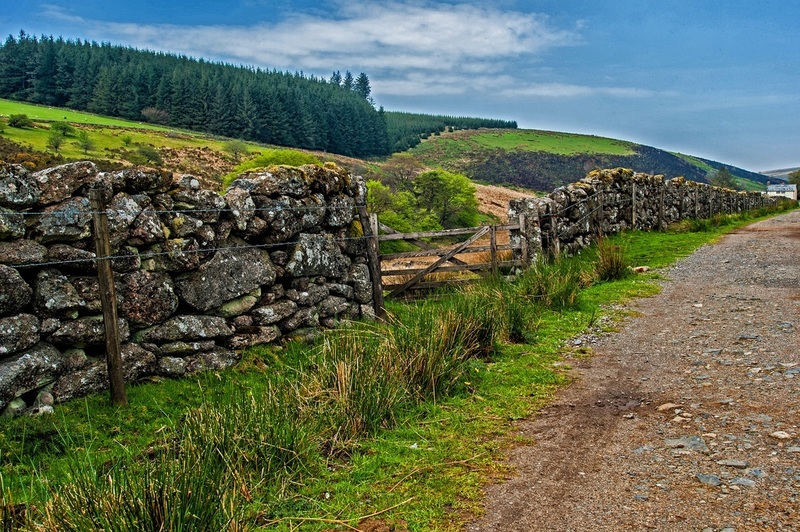 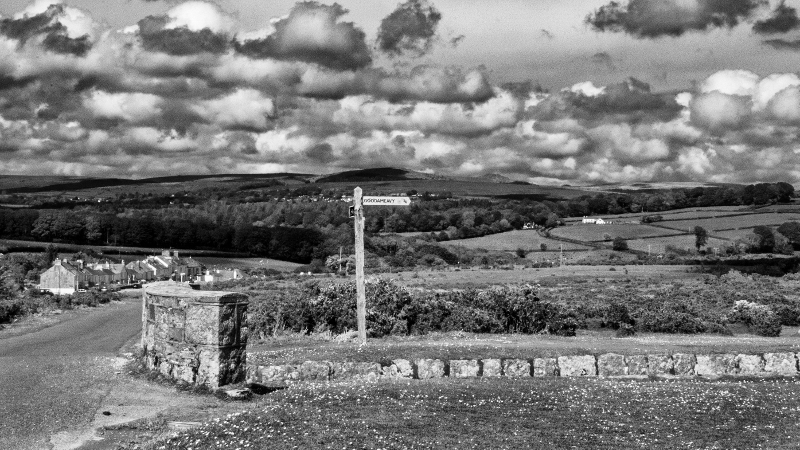 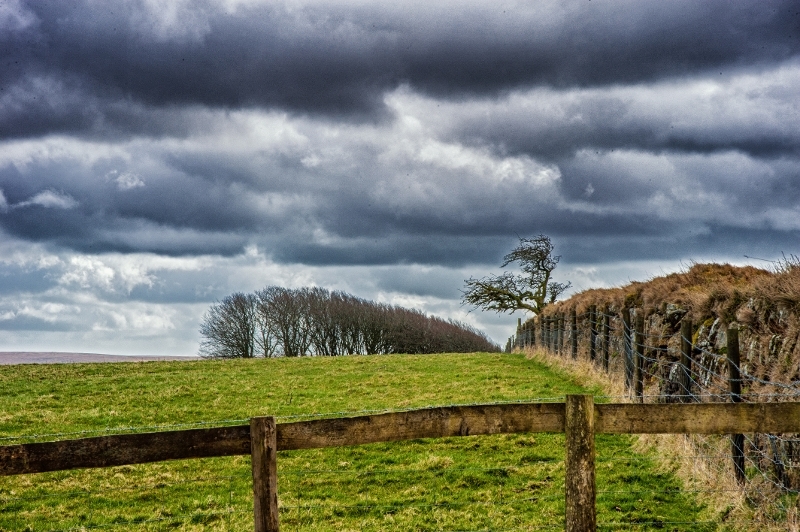 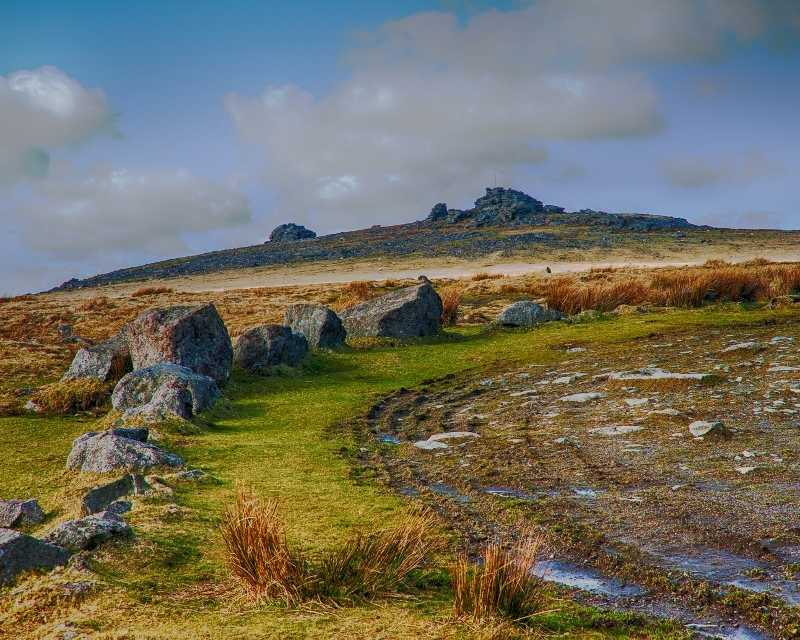 The moor is a National Park and a natural leisure attraction for nearby towns and cities. 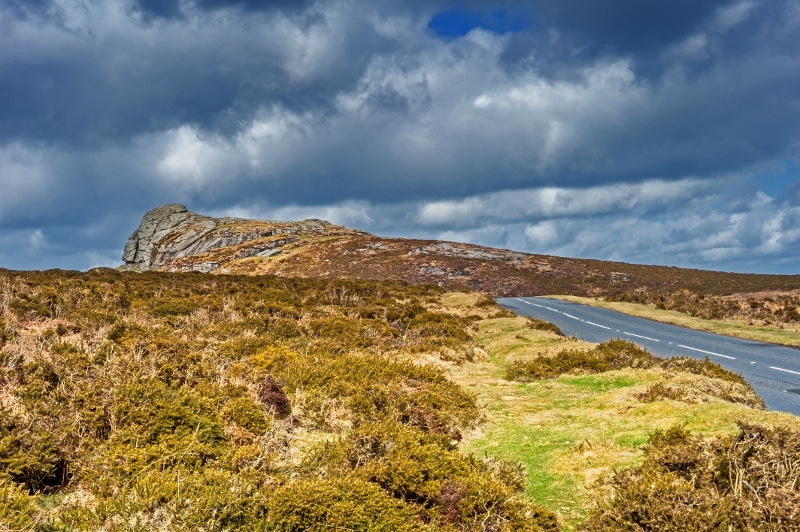 Although it is wild and beautiful, it can be extremely dangerous in bad weather for those unprepared for rapidly changing conditions. 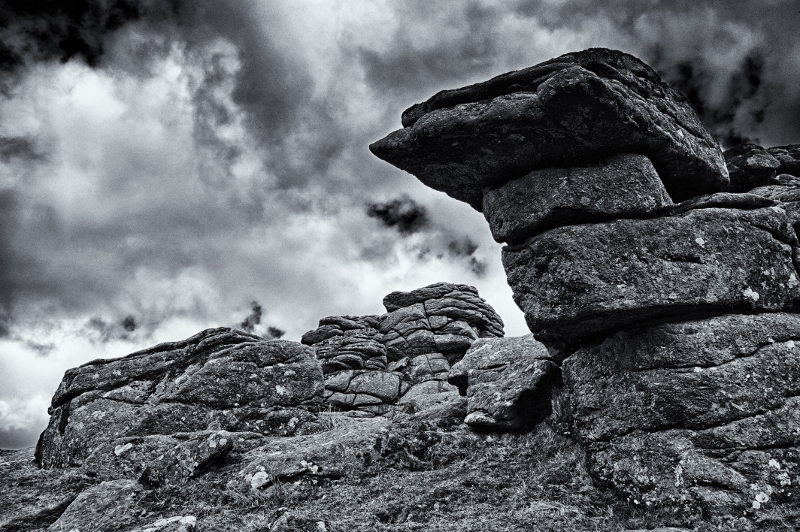 I hope you will enjoy the photos I will post on this page as much as I enjoy photographing this wild and beautiful landscape. 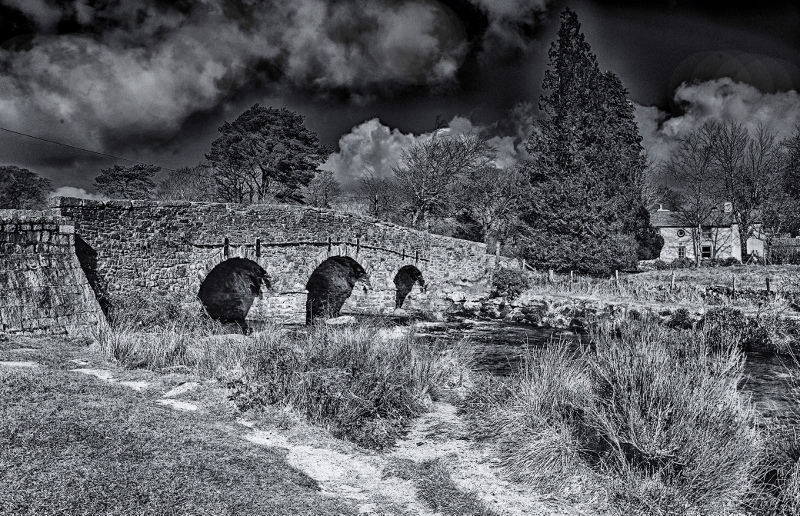 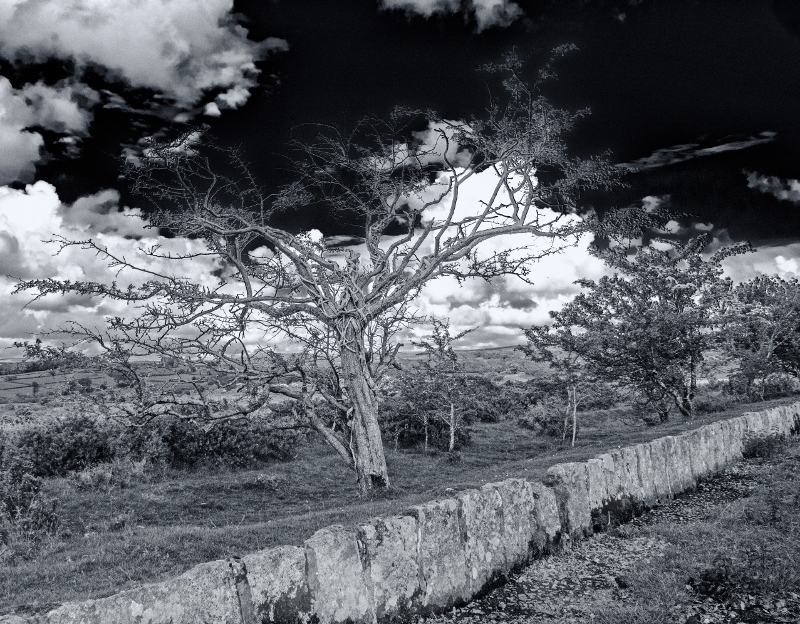 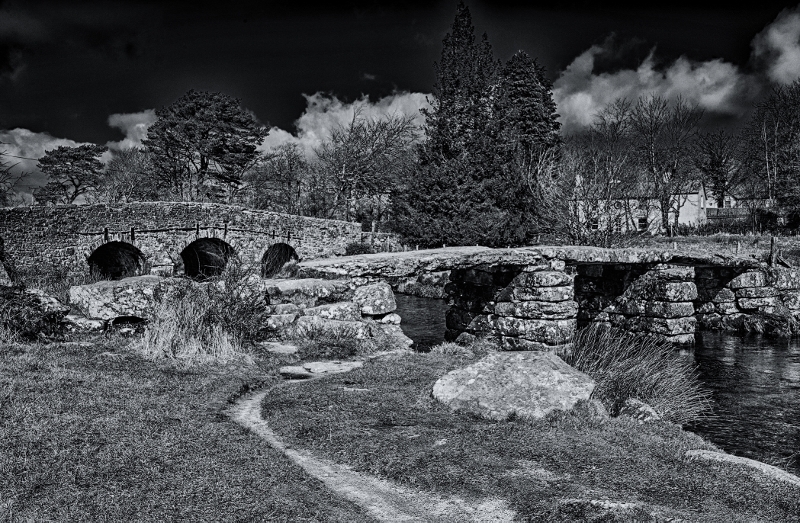 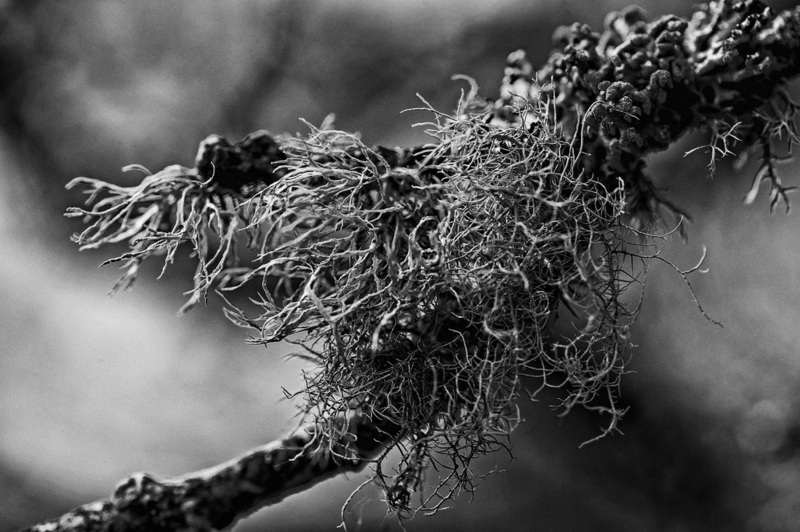 I have included some black and white images to provide some variety. 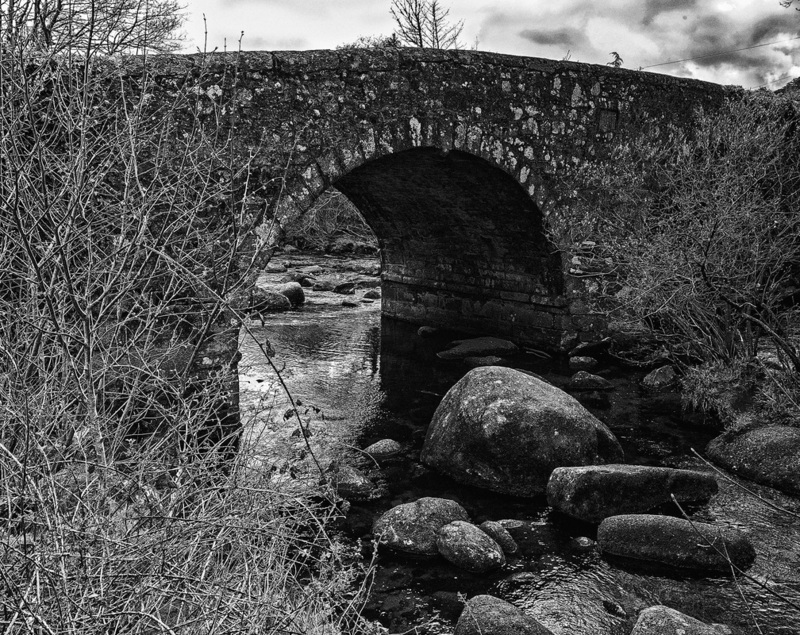 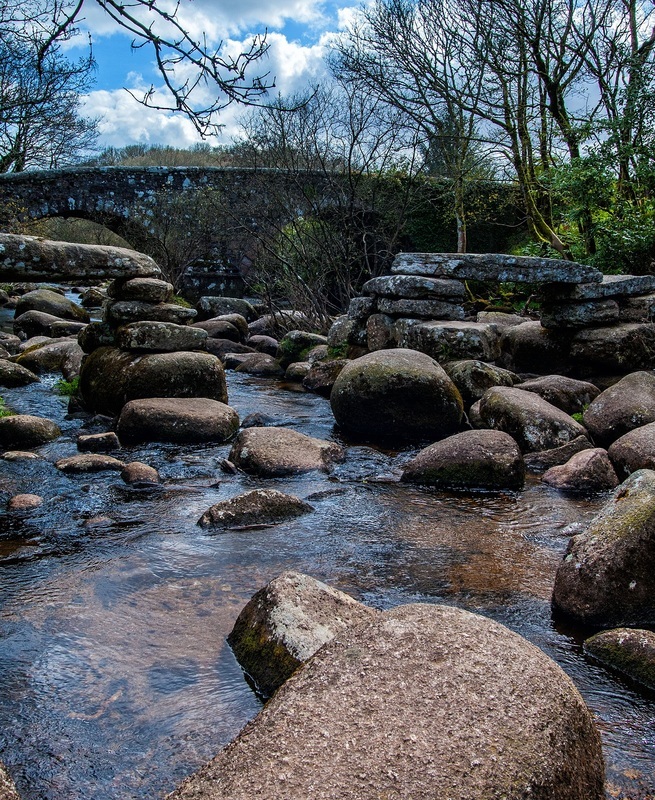 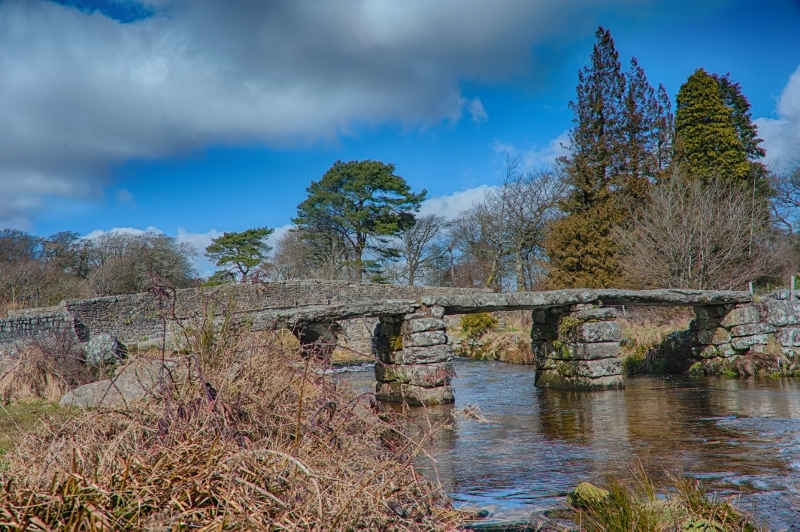 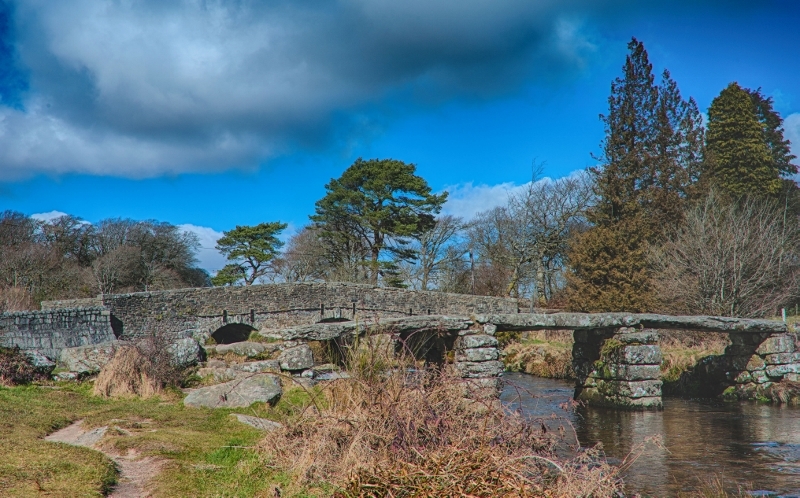 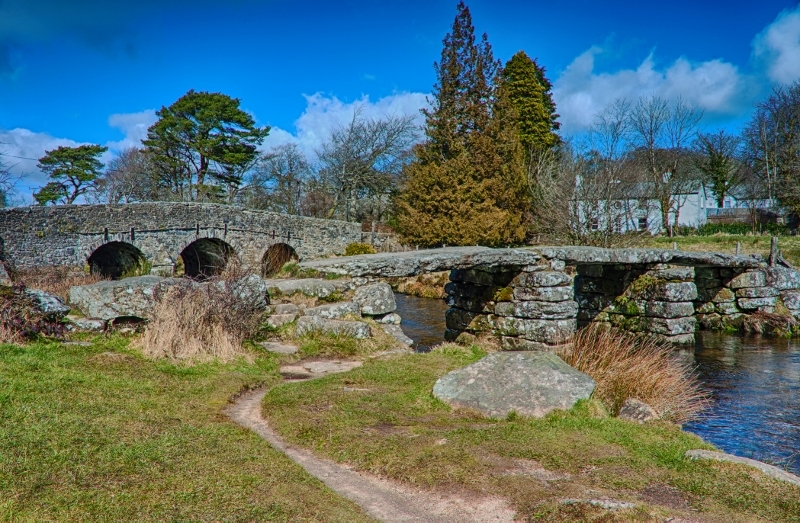 Postbridge is a small hamlet that contains an ancient "clapper bridge", a bridge made from natural flat stones and a more recent stone arch bridge. 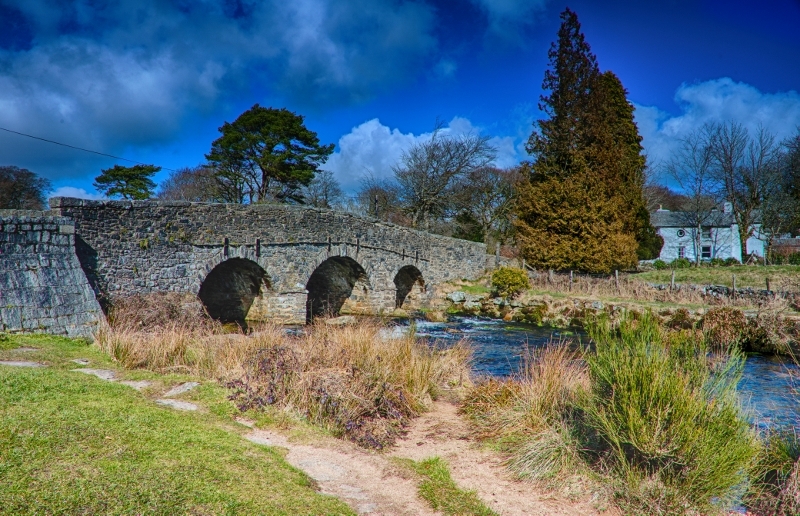 It is a great local attraction on beautiful summer days for relaxing by the river. 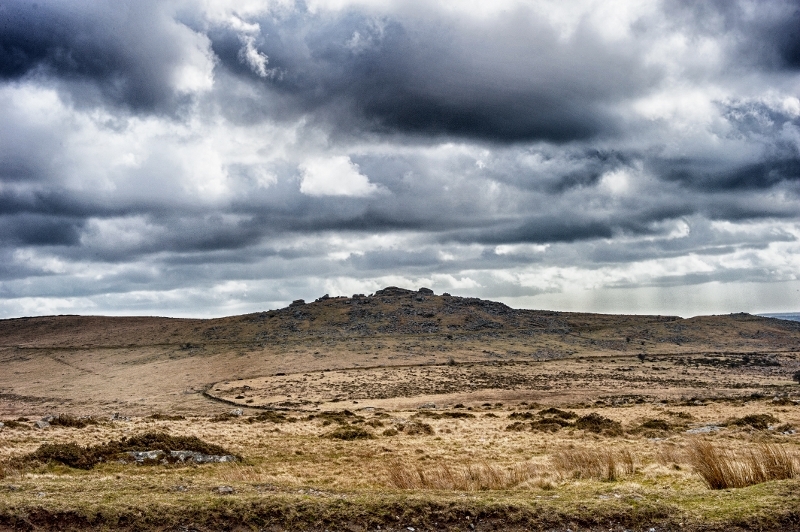 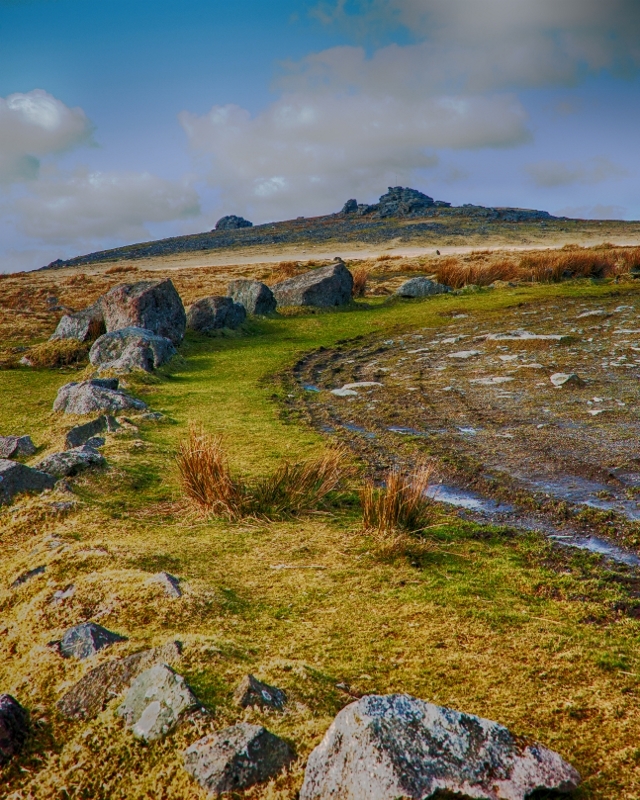 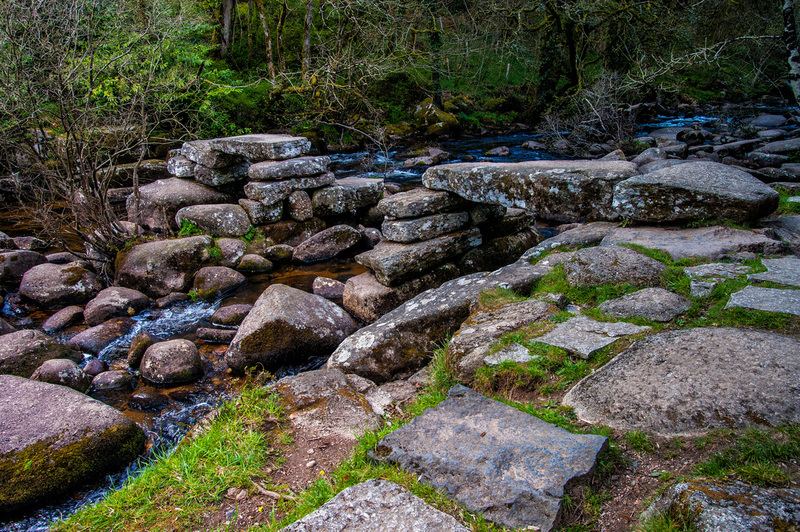 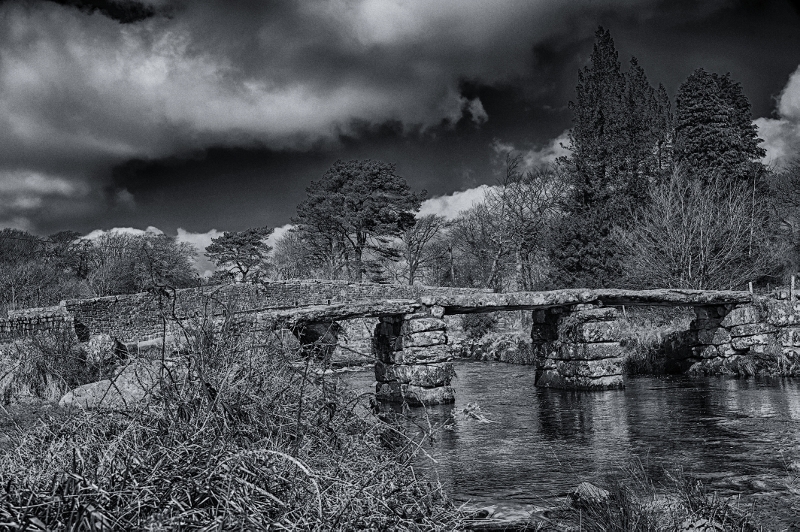 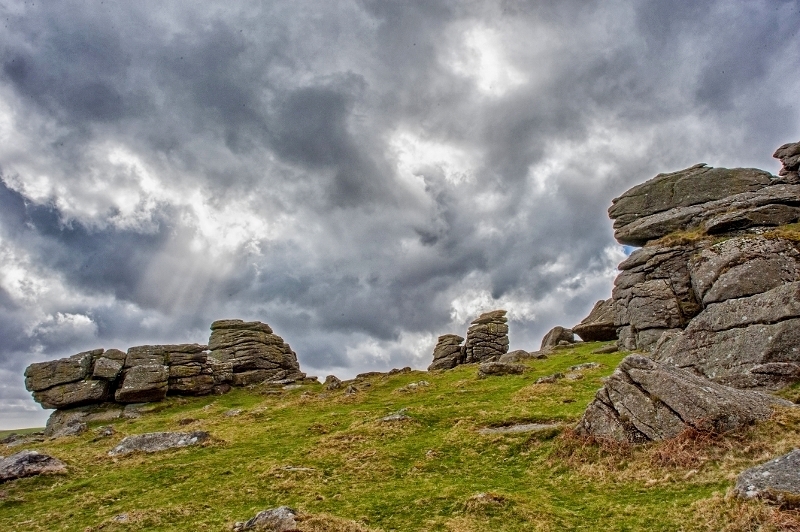 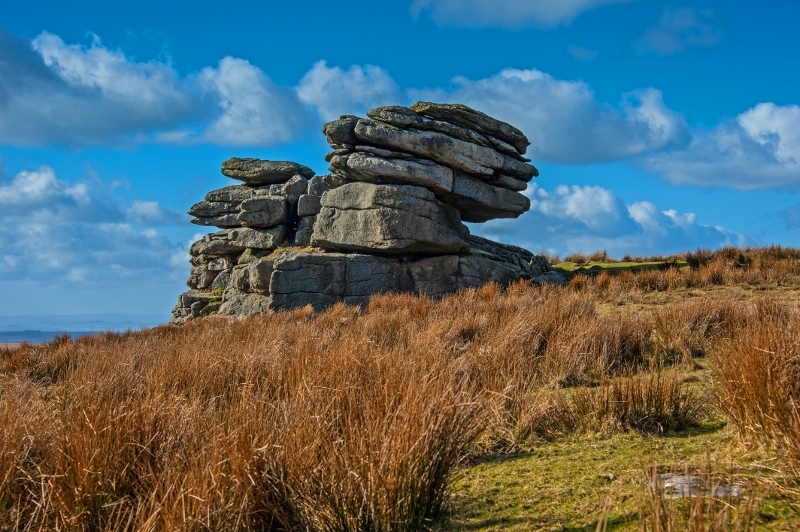 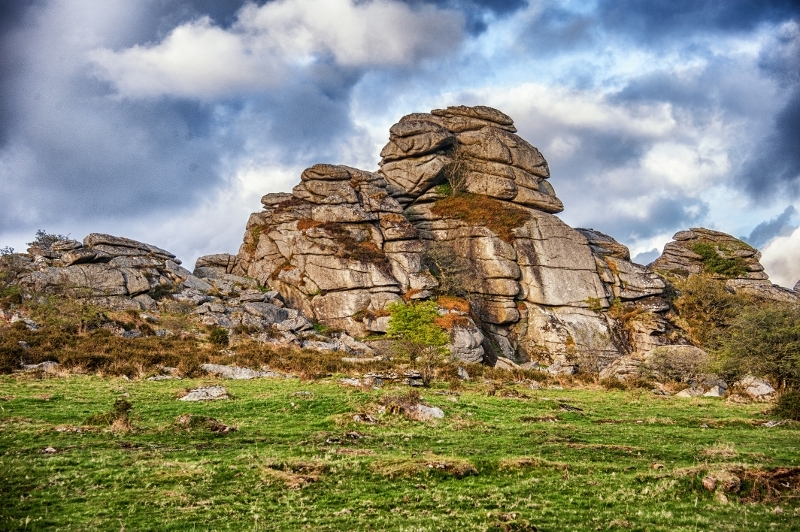 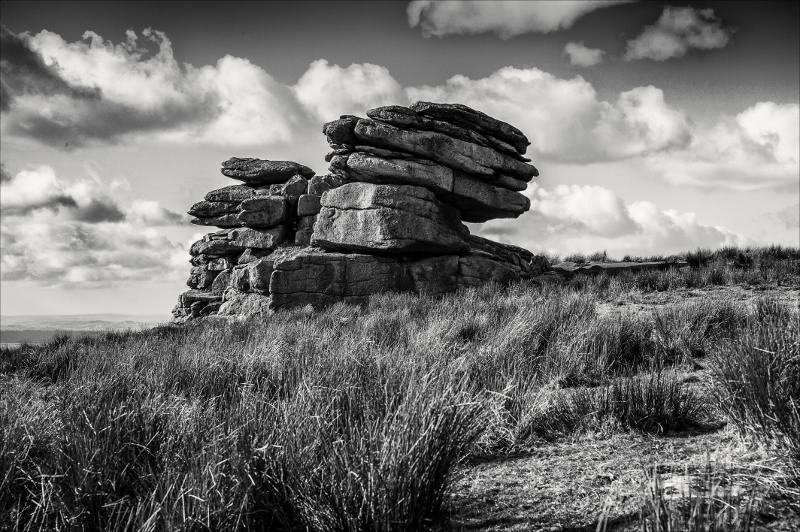 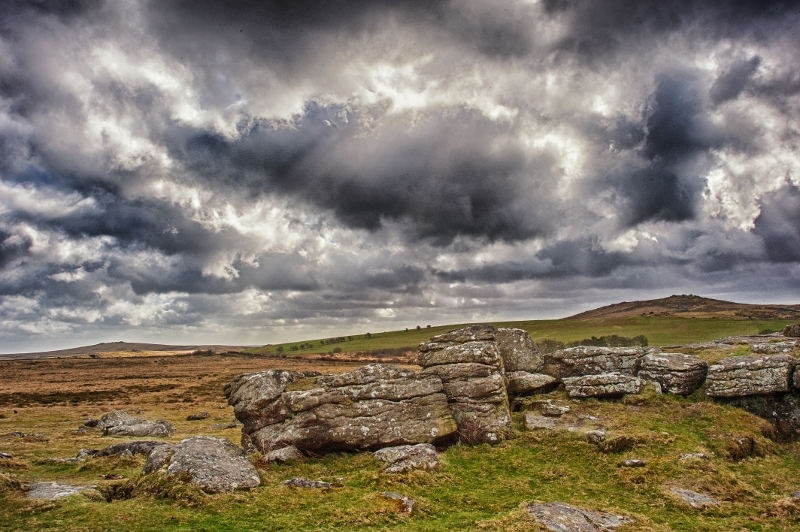 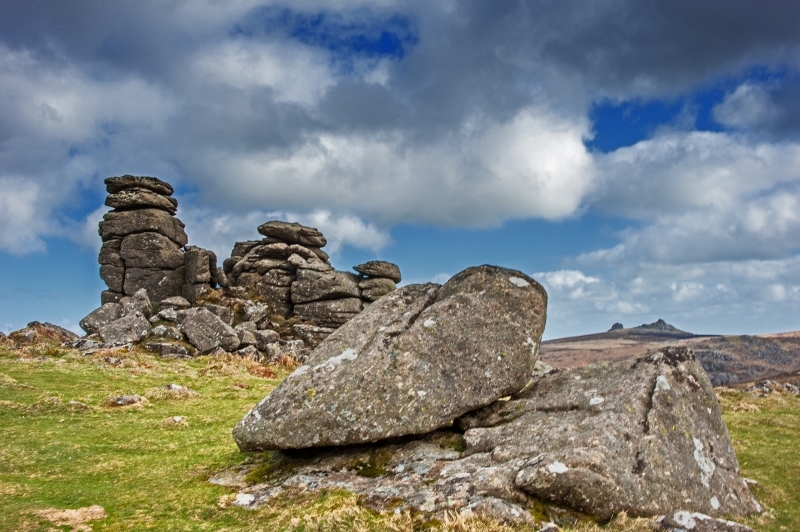 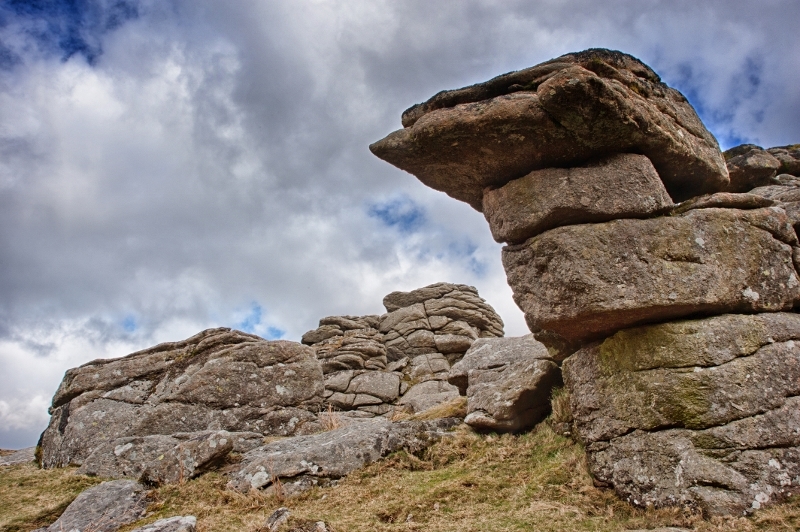 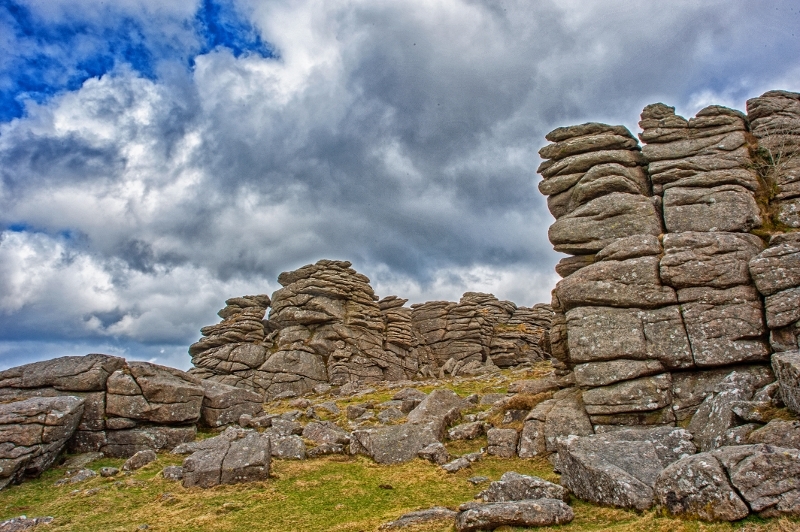 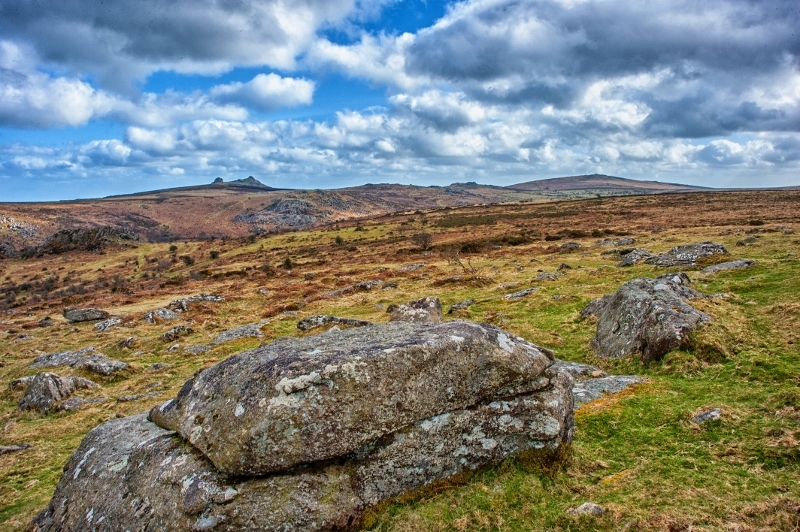 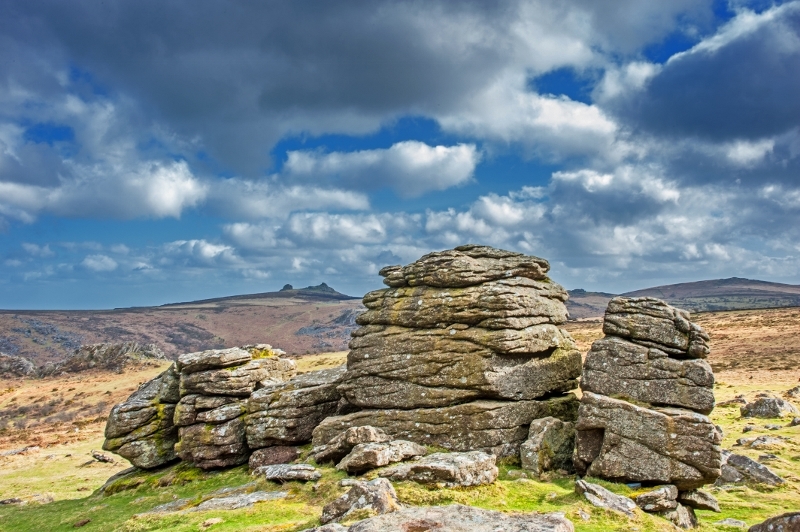 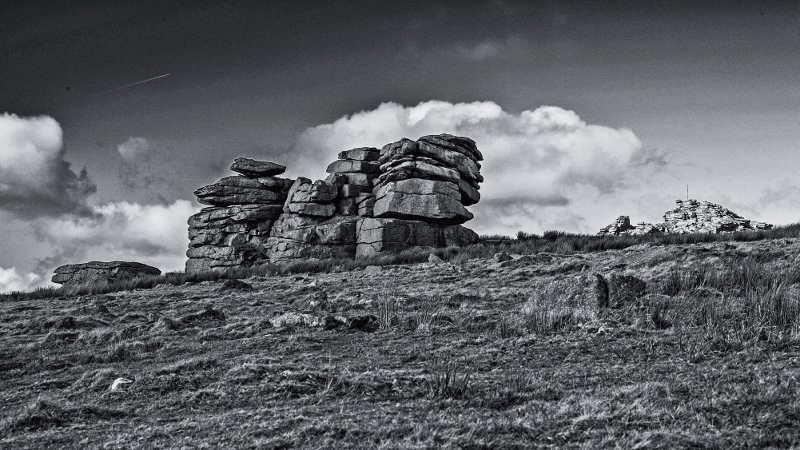 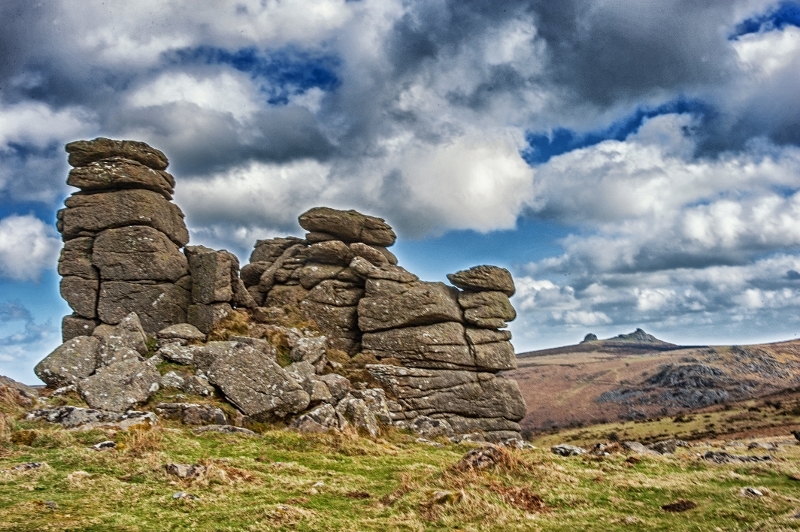 Tors are outcrops of rock, usually granite, that give Dartmoor it's unique character. 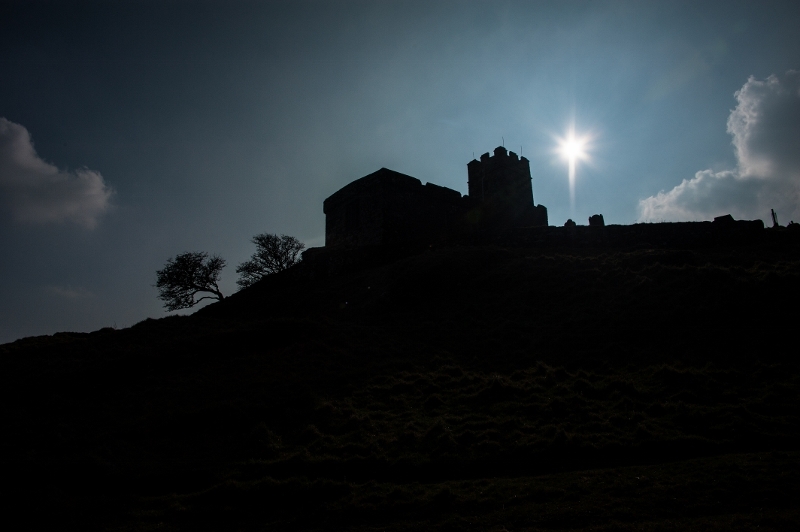 More images will follow - keep coming back !! 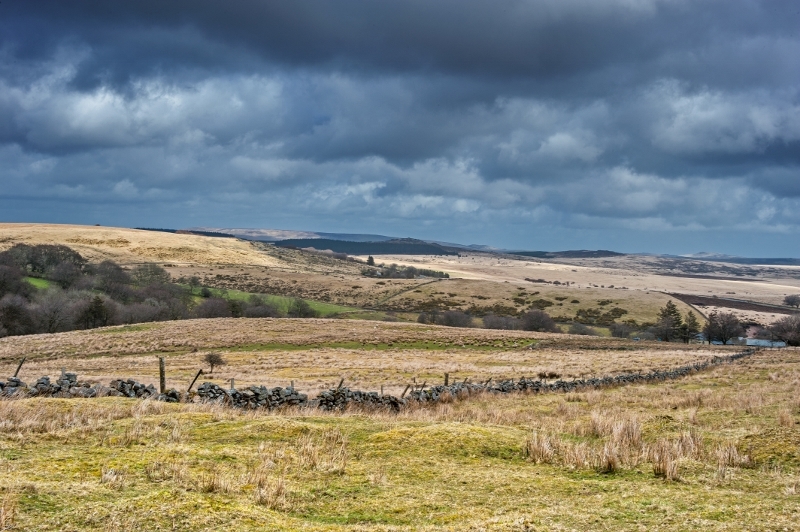 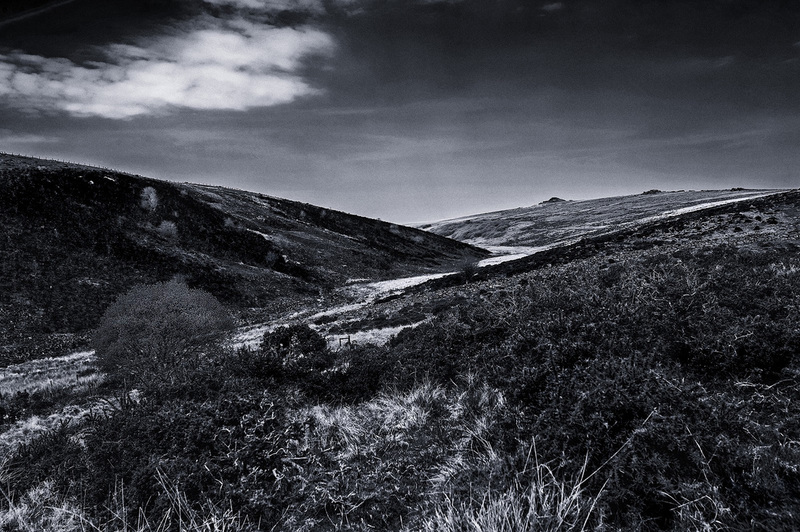 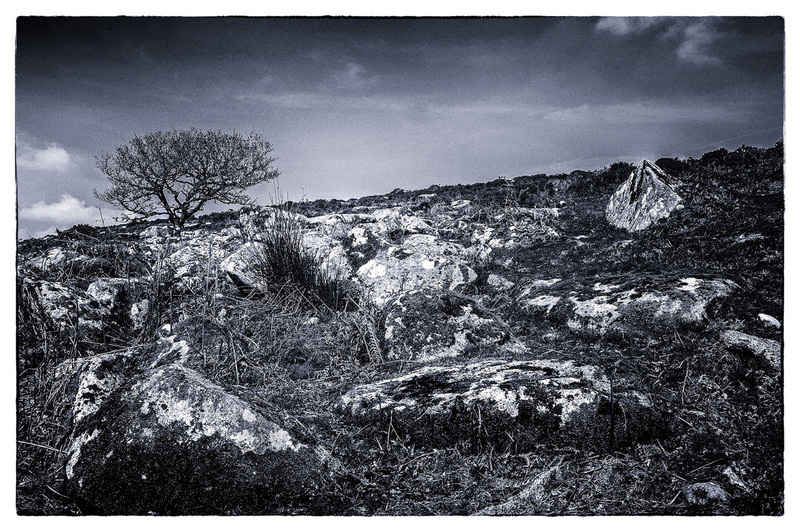 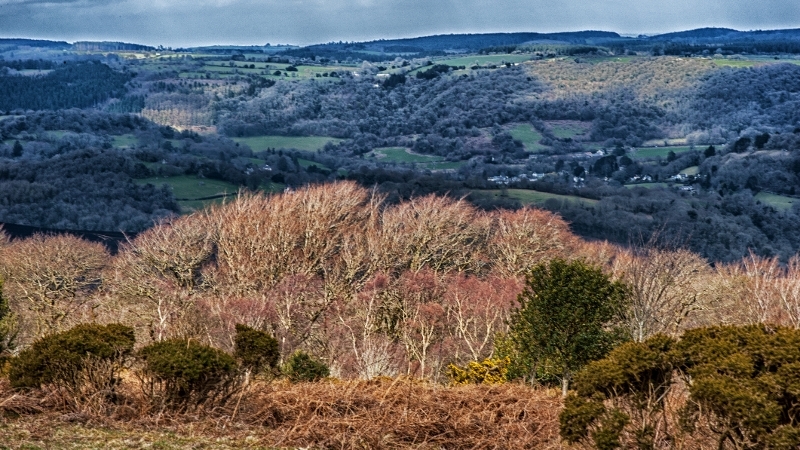 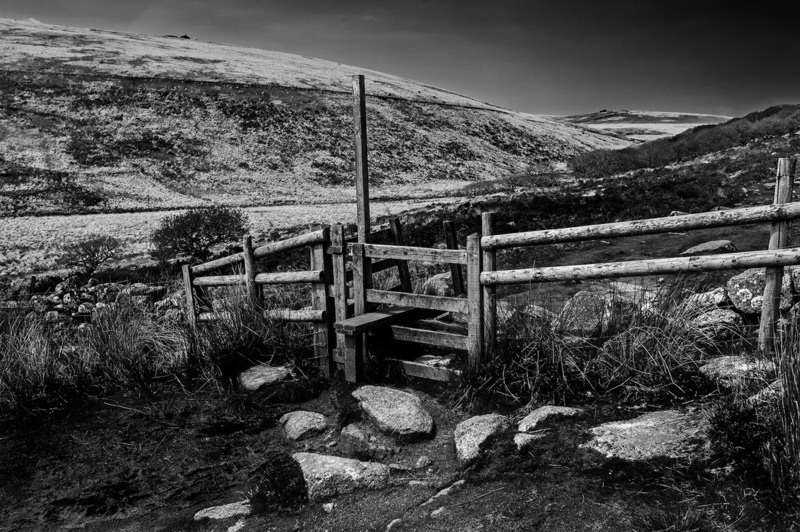 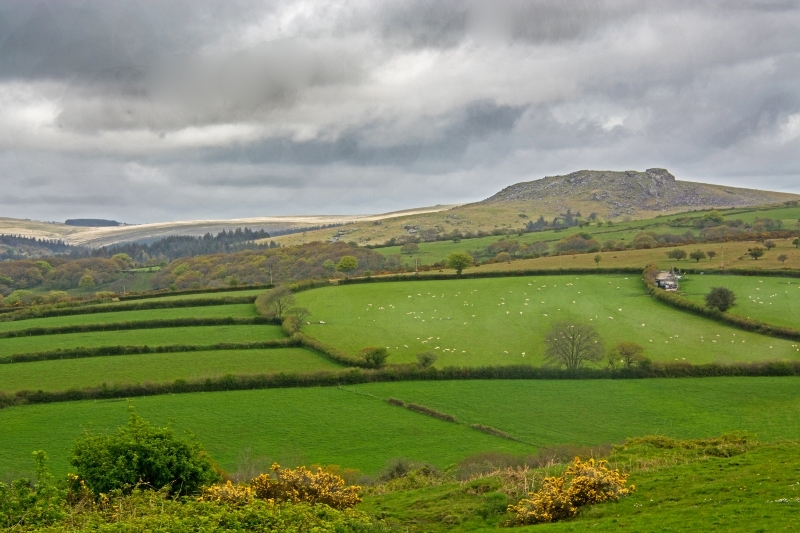 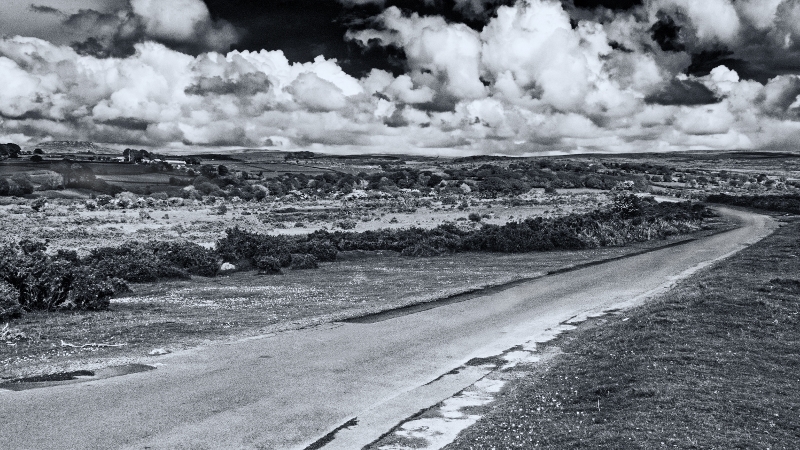 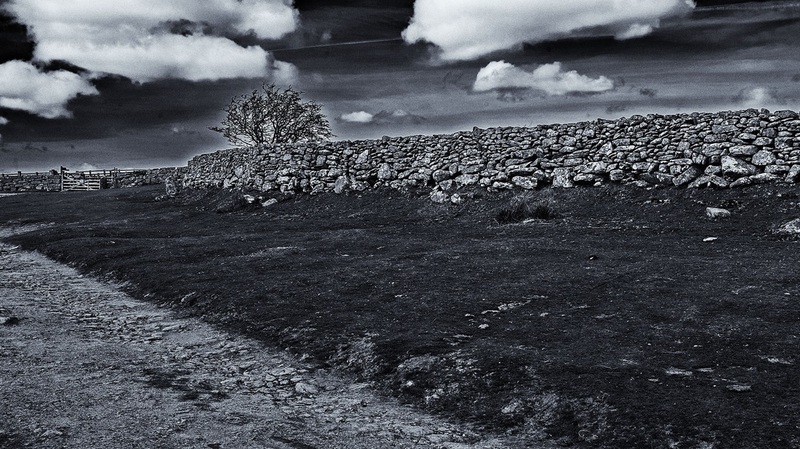 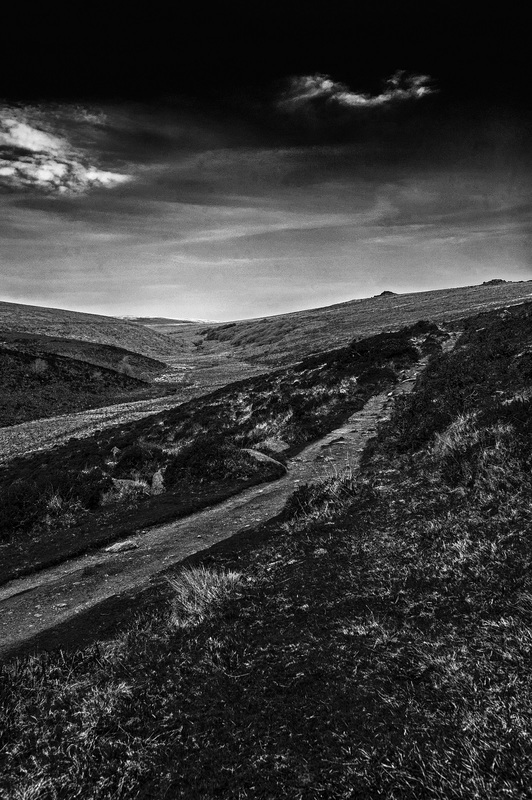 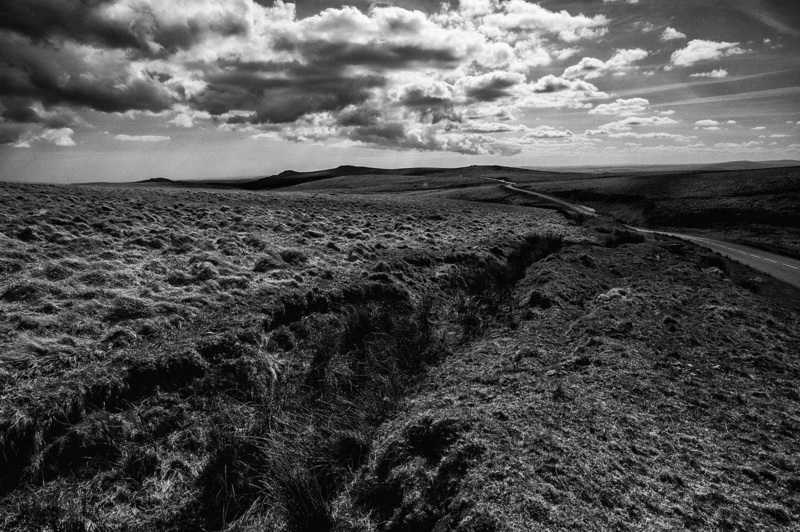 The edge of Dartmoor, near Clarbrook. 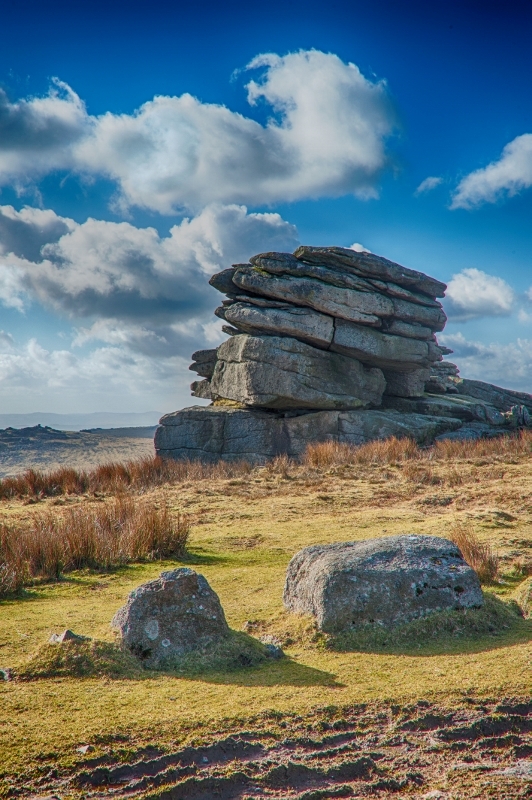 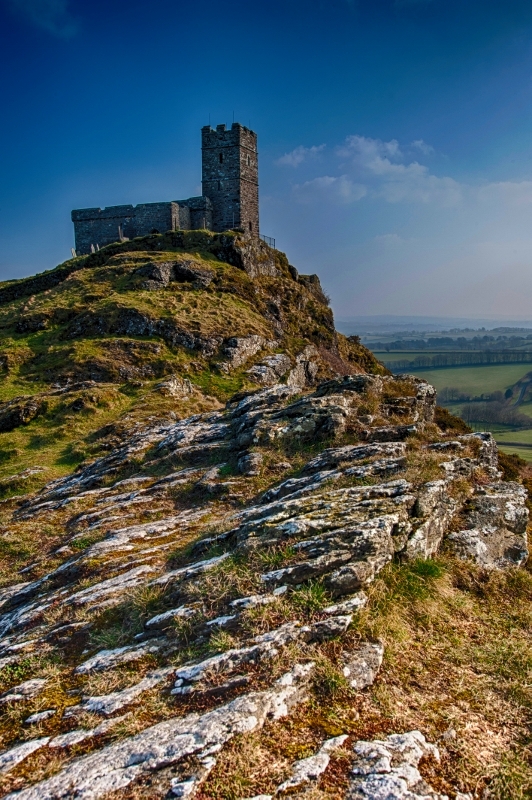 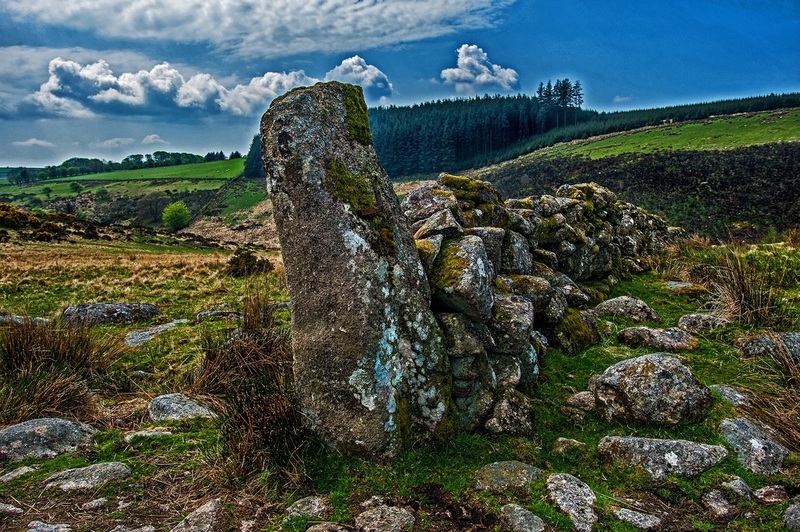 Brent Tor is a tor near Tavistock, Devon. 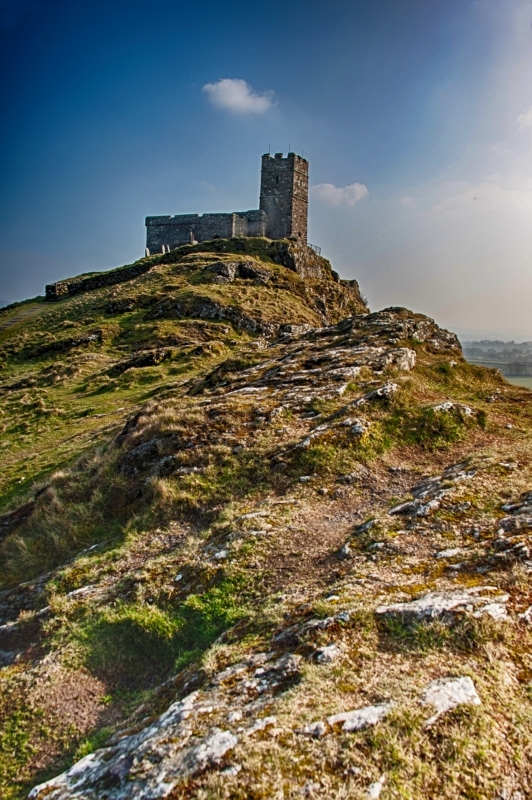 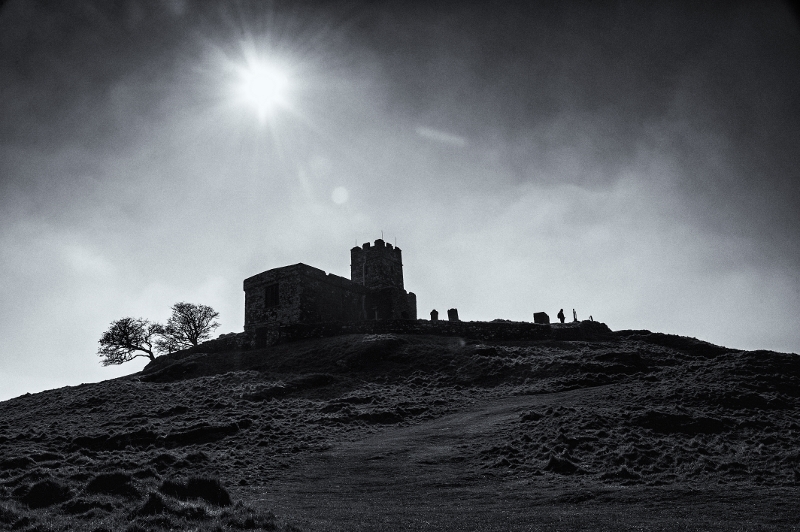 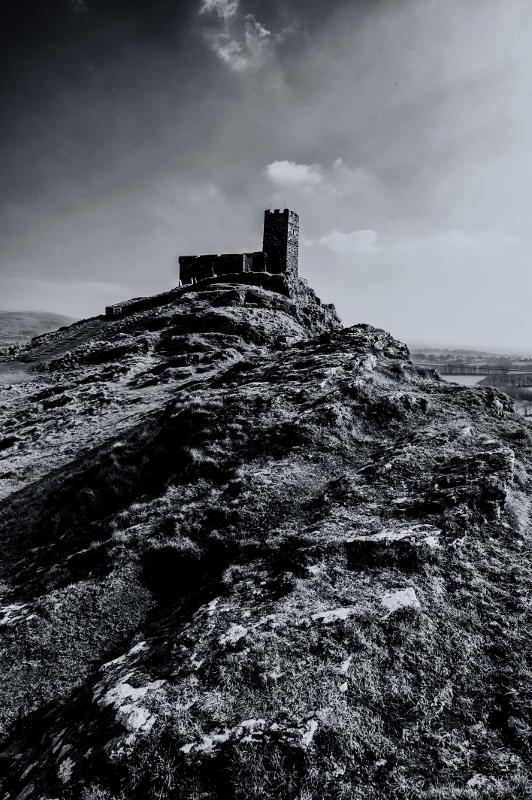 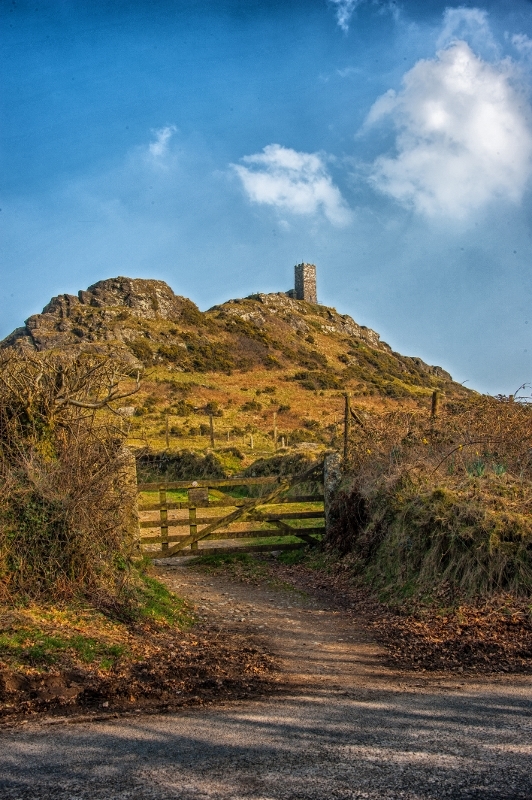 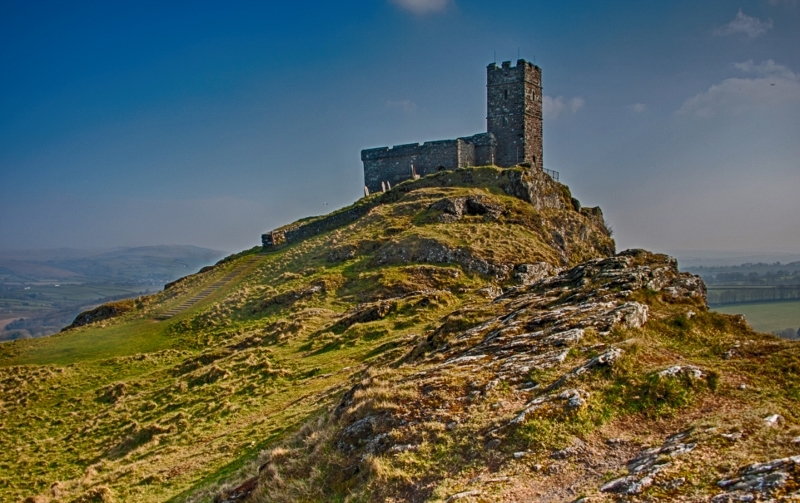 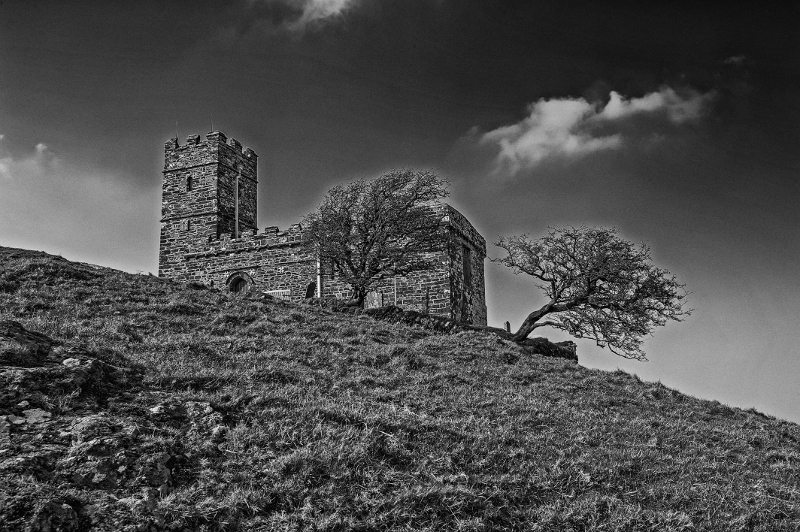 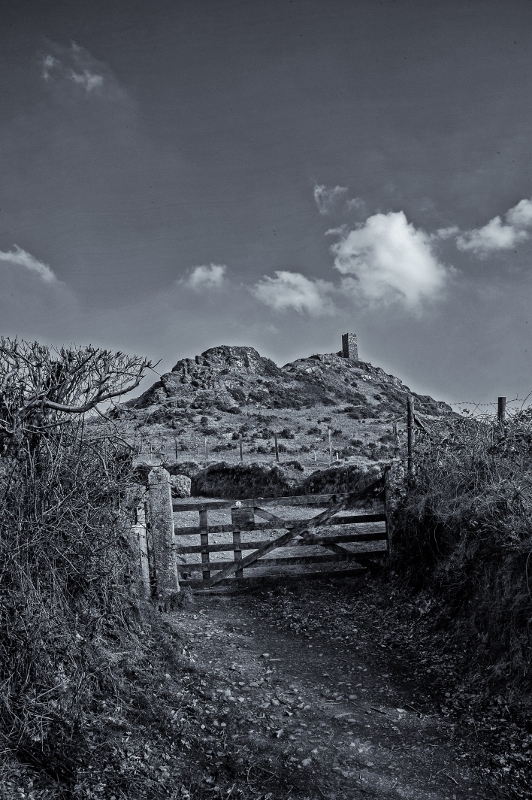 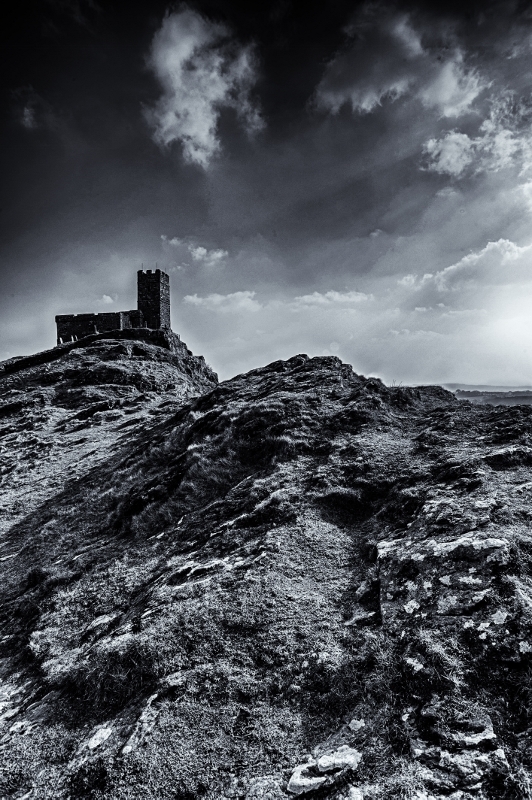 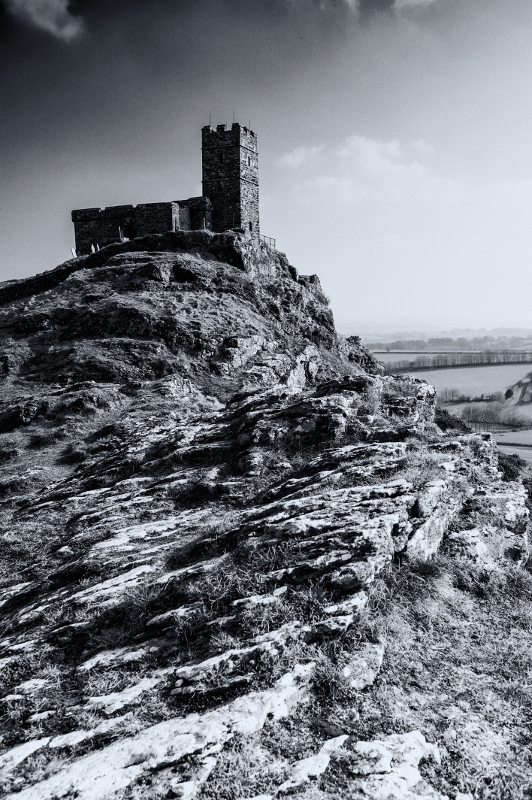 It has a church on the summit of the tor. 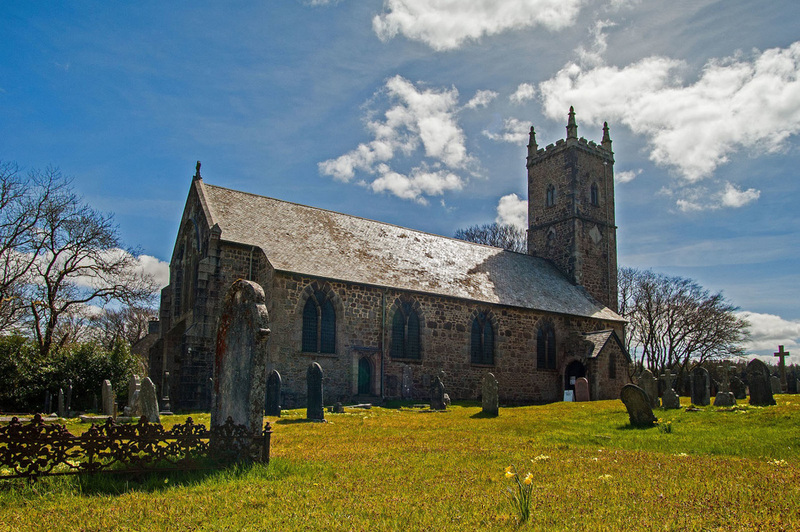 The church is still a working church for the local community. 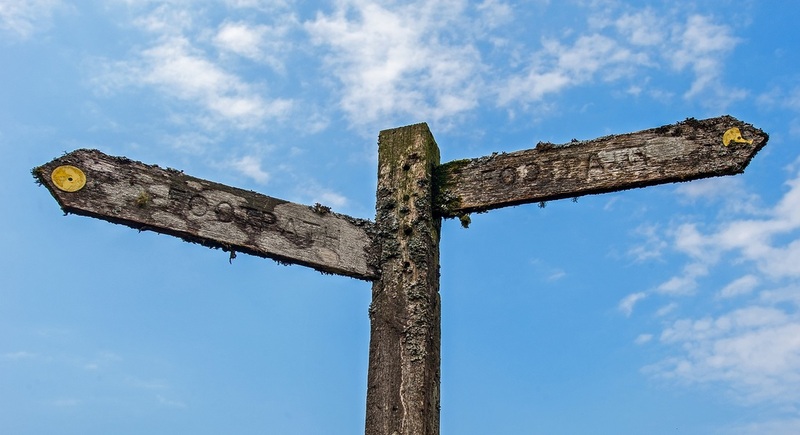 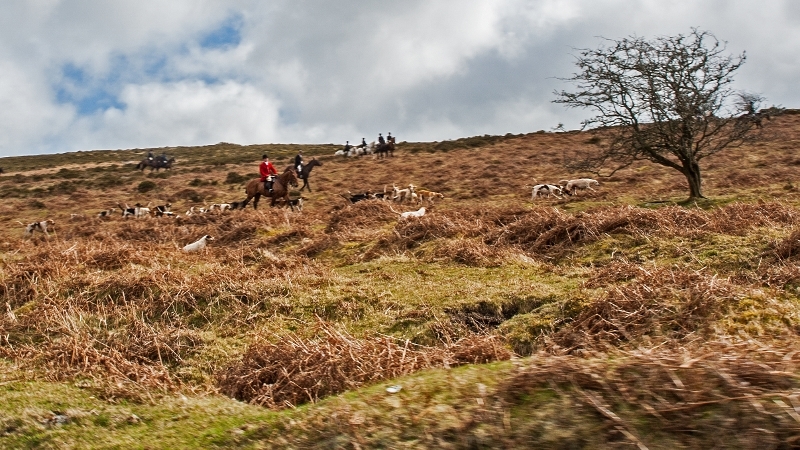 Foxhunting is now banned in the UK, but hunts are allowed to follow scent trails laid down before the hunt. 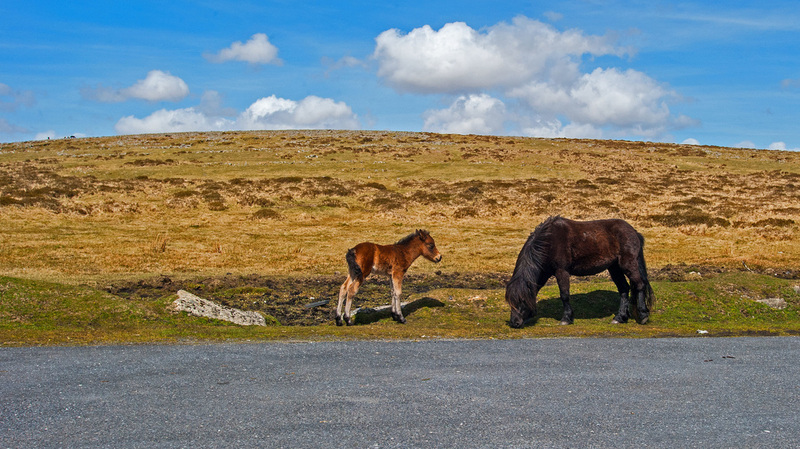 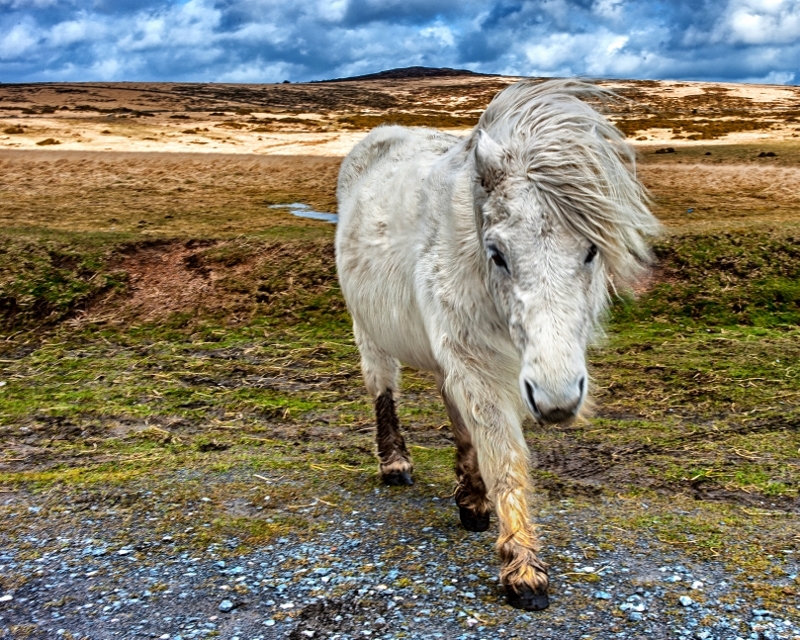 Dartmoor ponies are a specific breed of pony. 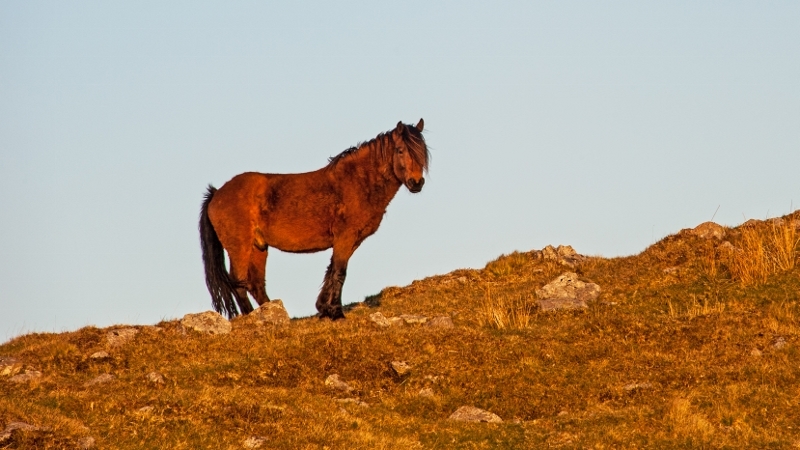 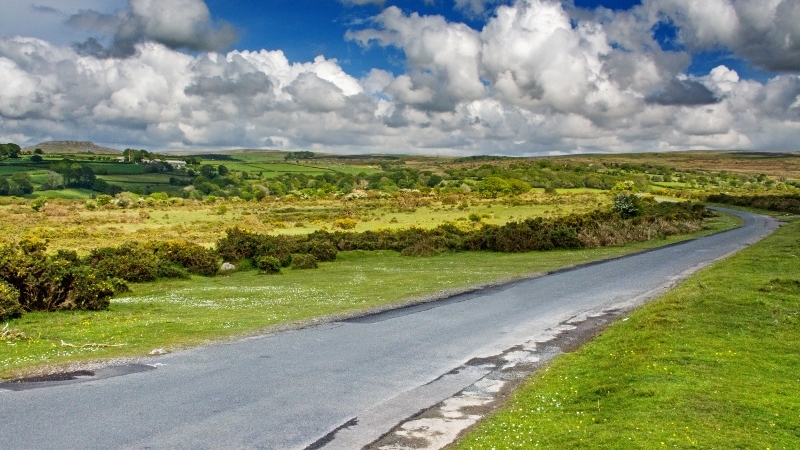 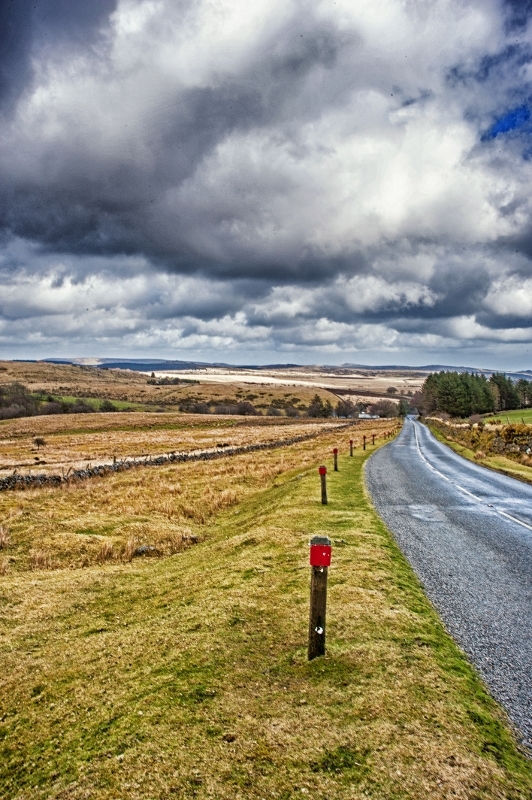 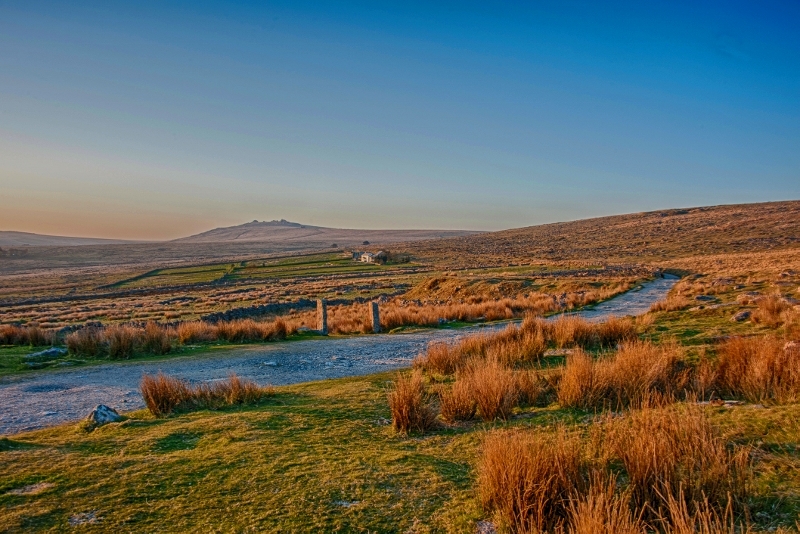 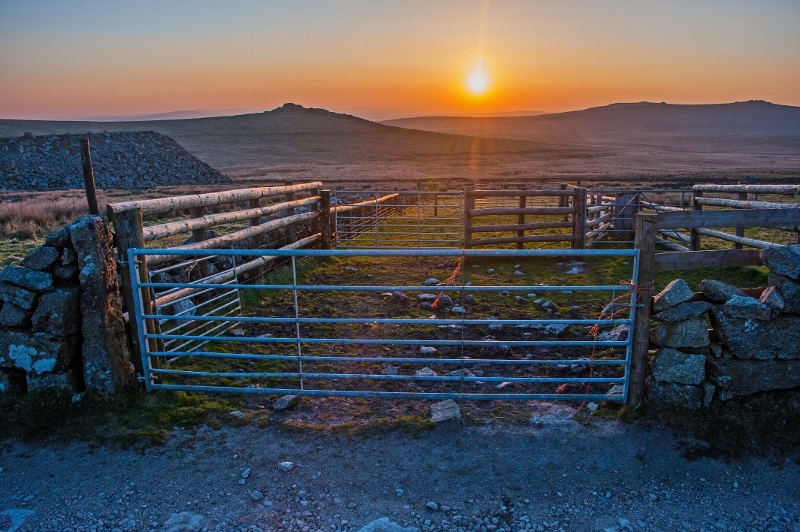 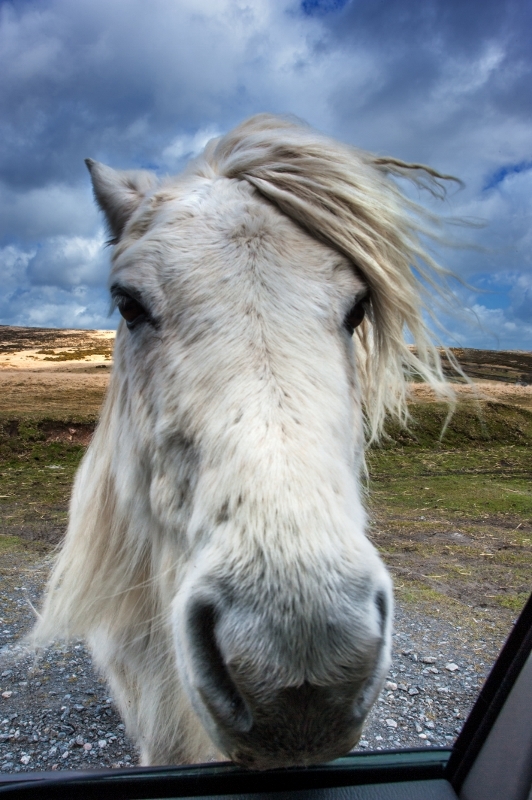 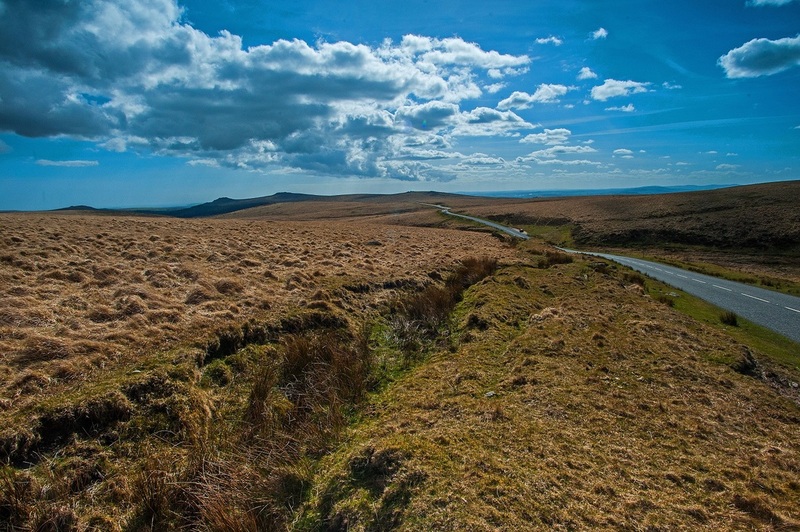 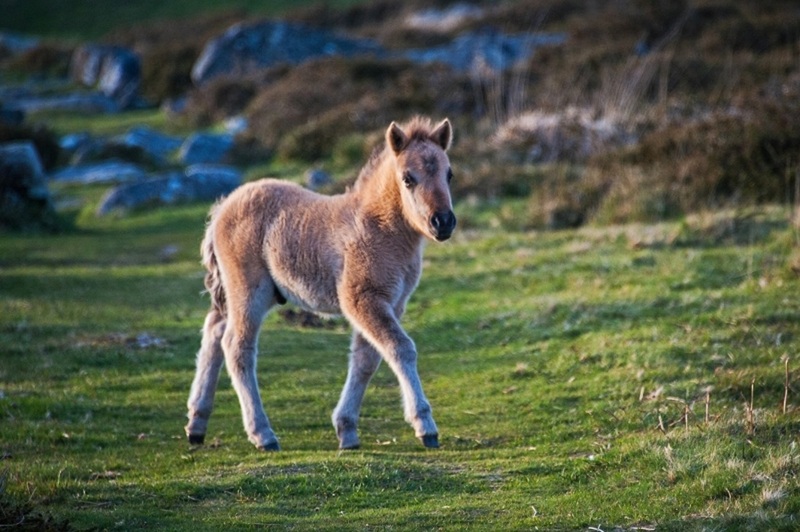 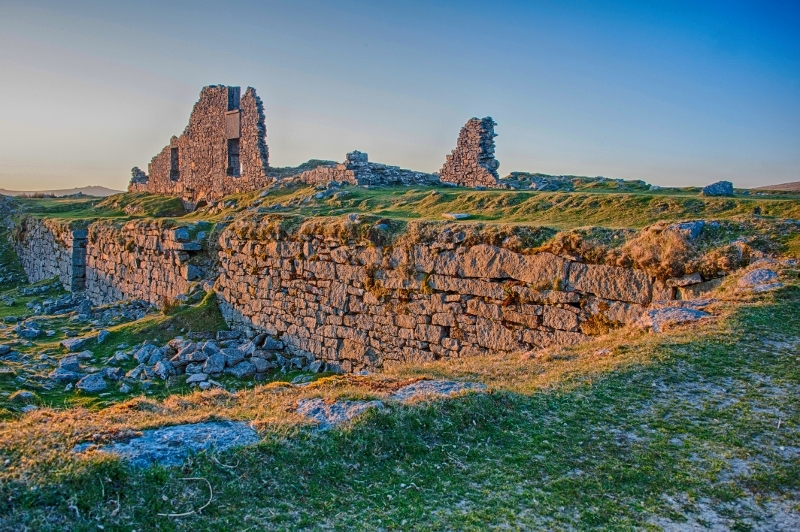 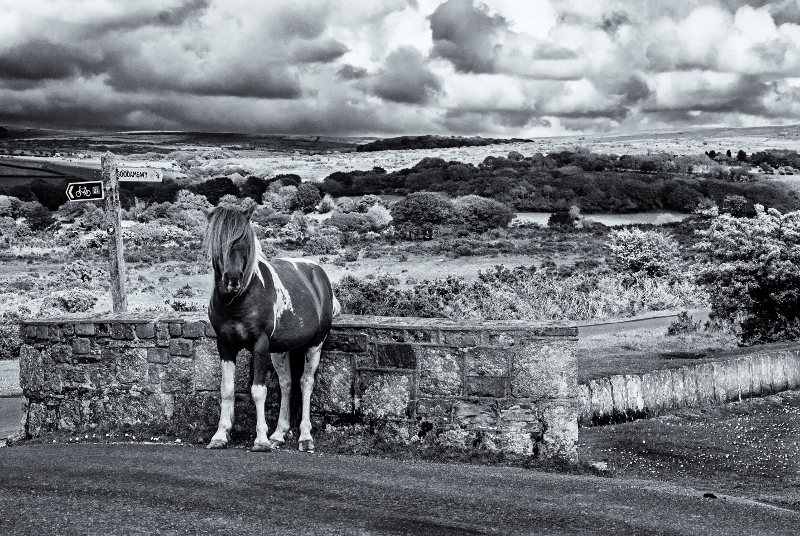 Although owned by people, they are allowed to roam free on the moor and help maintain the distinct look of Dartmoor. 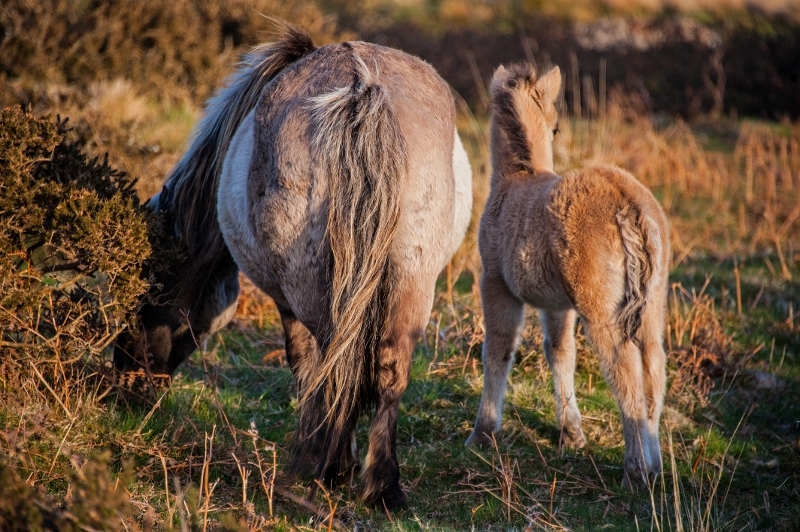 Over-breeding has decreased their value and the health of the overall population. 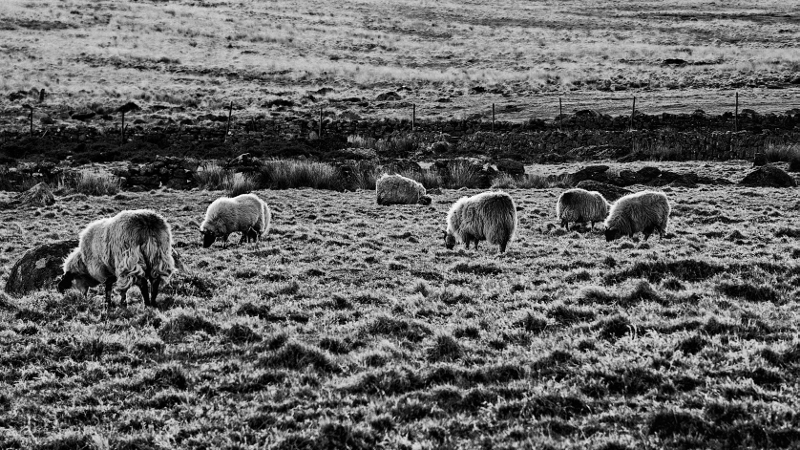 Many are quite take and will come right up to the car as this one did! 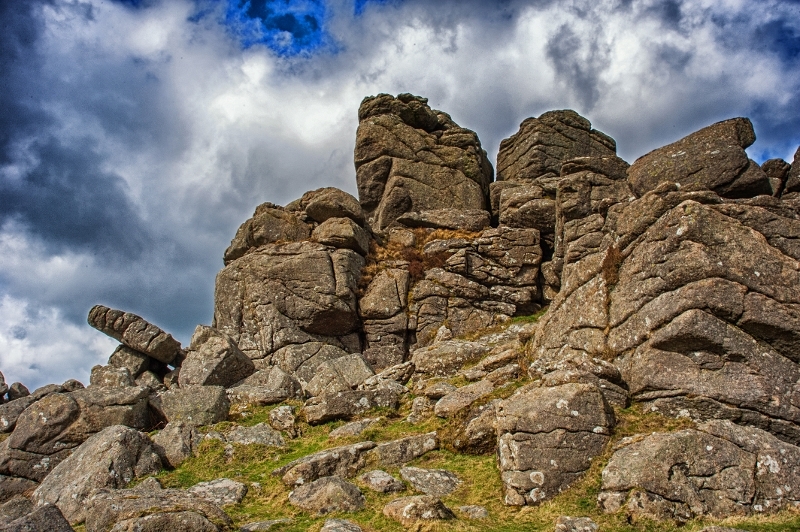 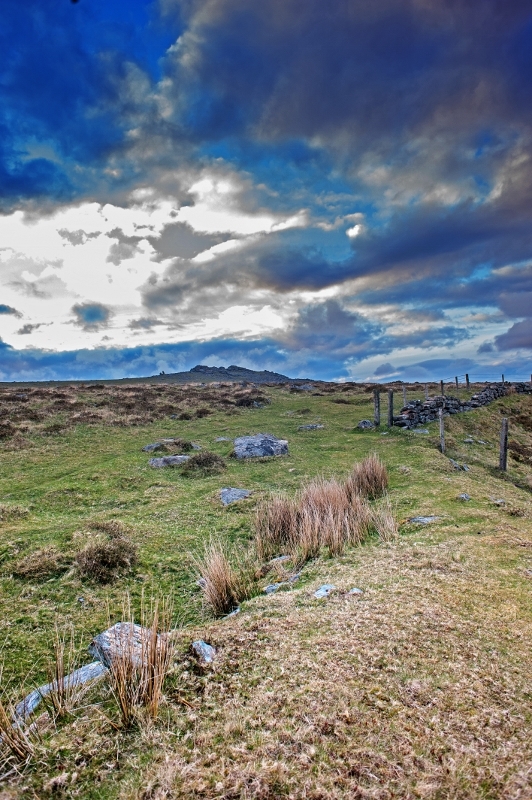 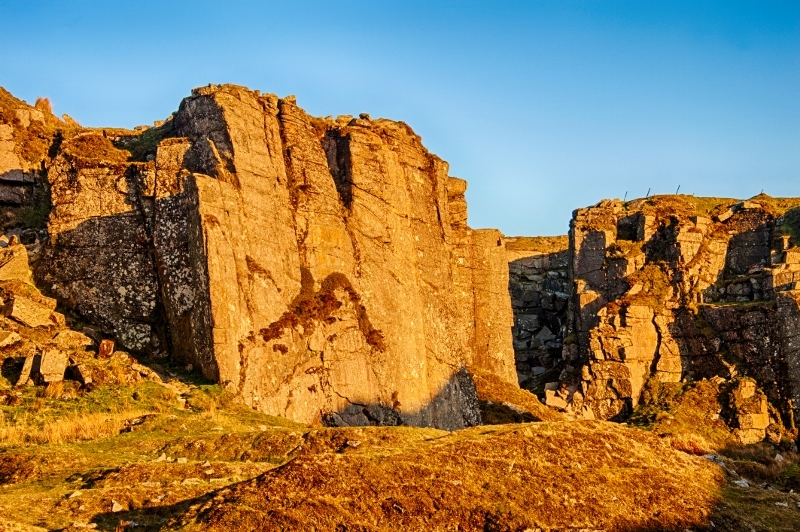 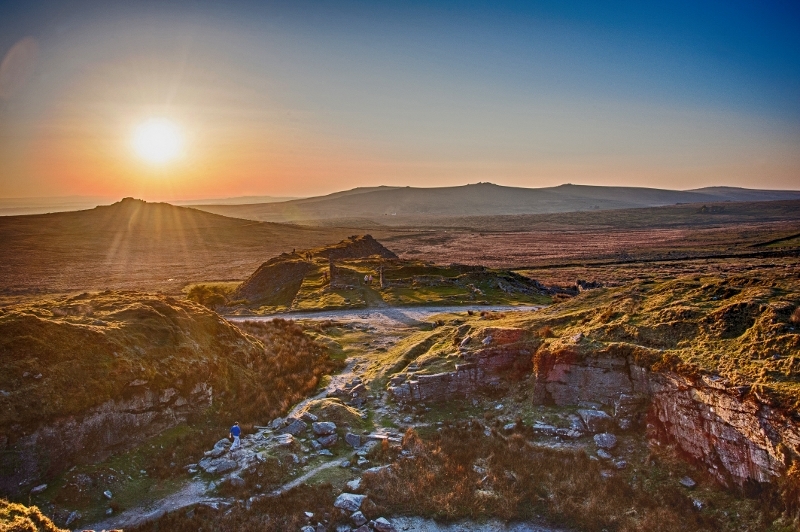 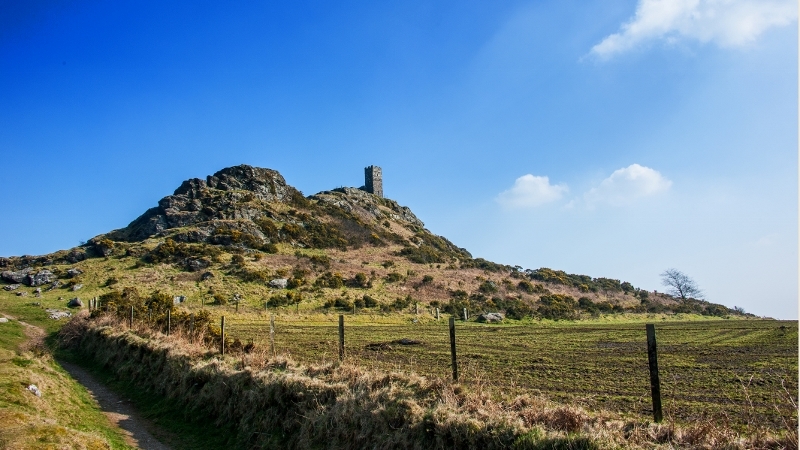 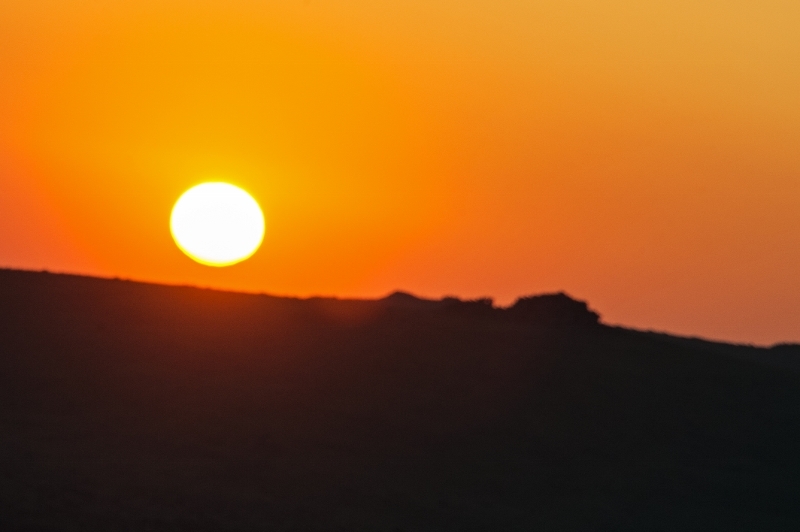 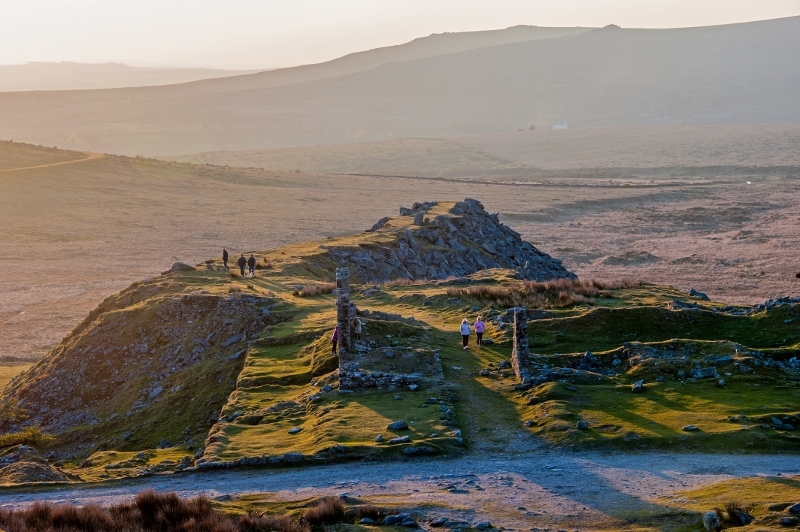 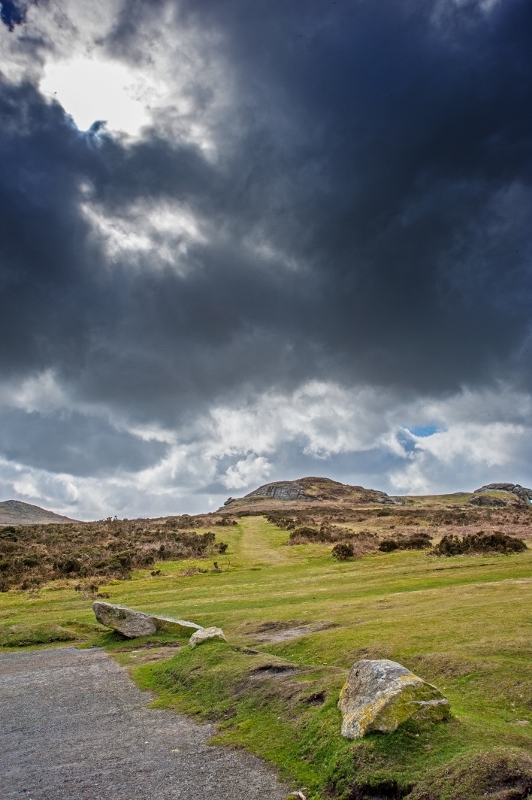 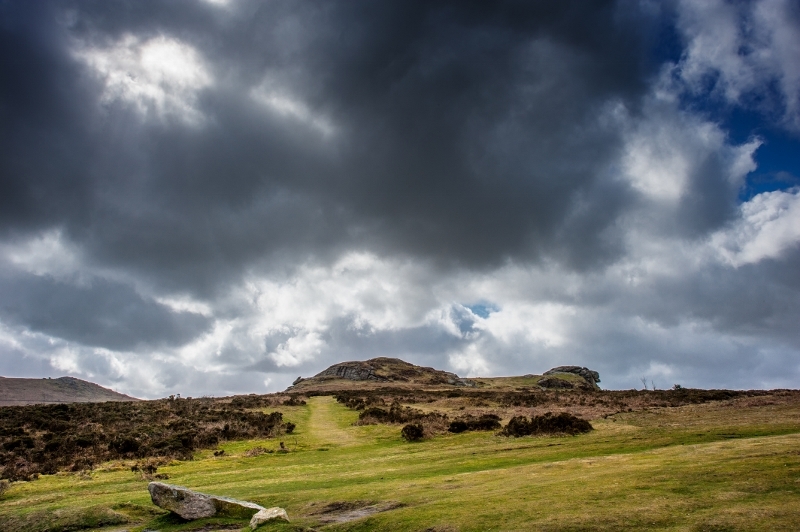 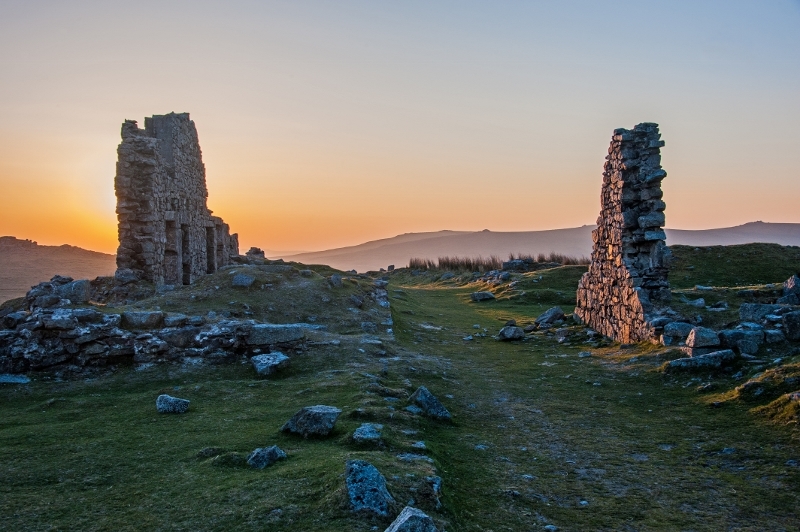 Haytor is a popular destination for walkers and family outings. 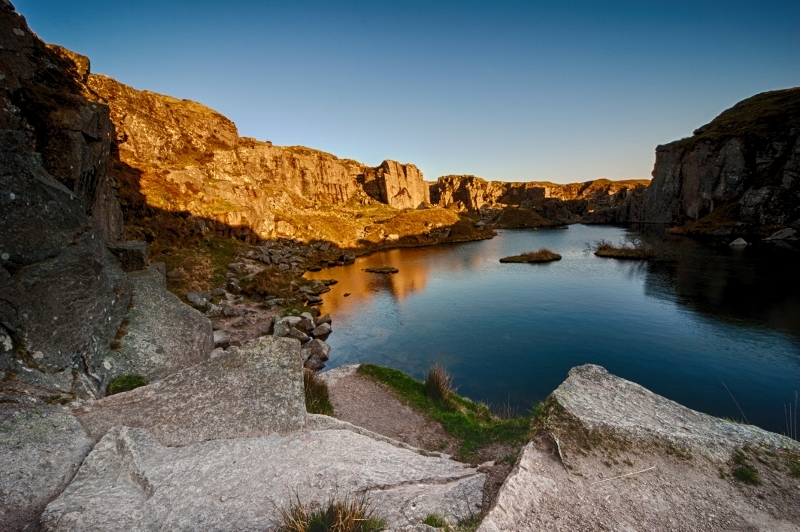 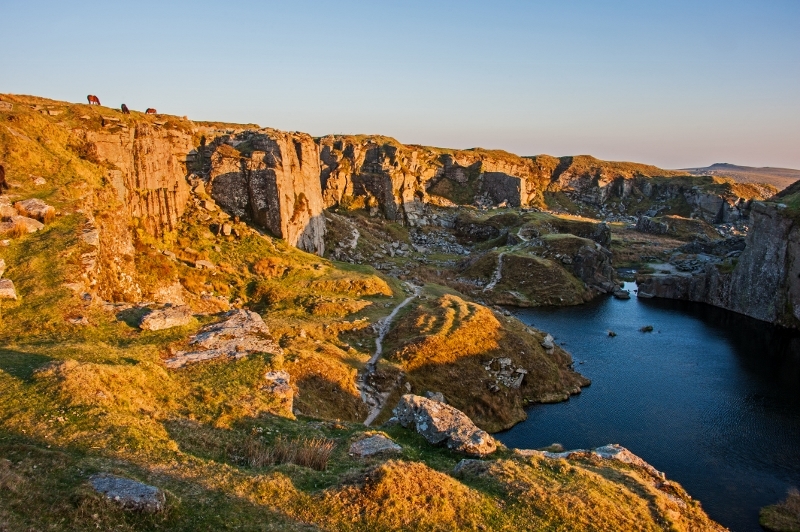 Foggintor Quarry is an old granite quarry near Princetown. 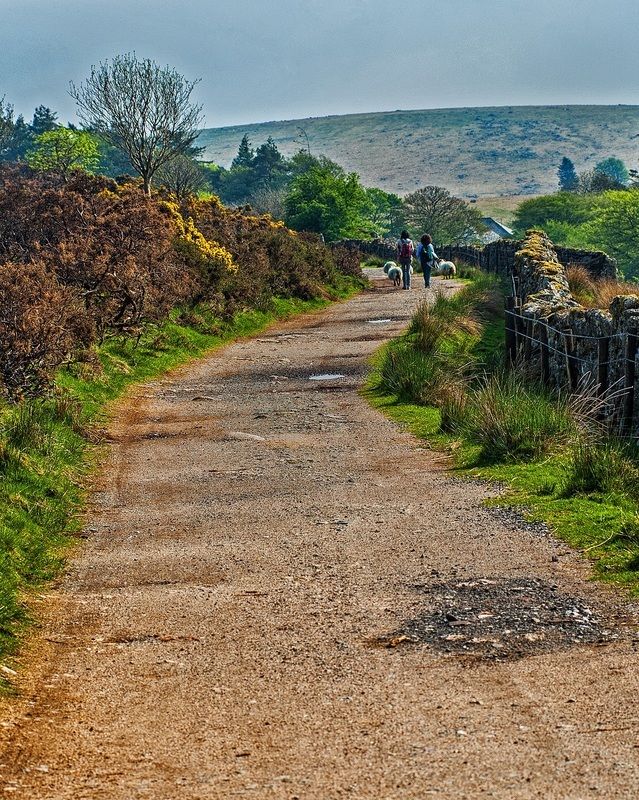 A railway was once used to transport the granite but this is now the path to the quarry. 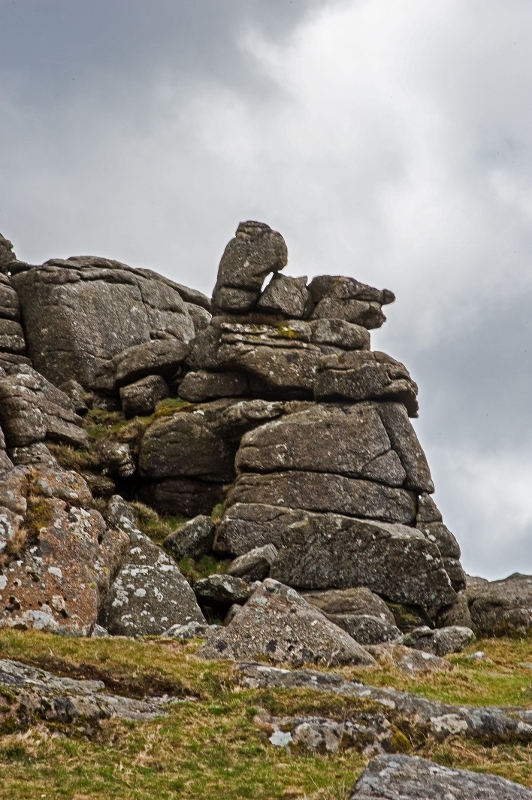 If you look closely, you will see some Dartmoor ponies grazing at the top of the cliffs. 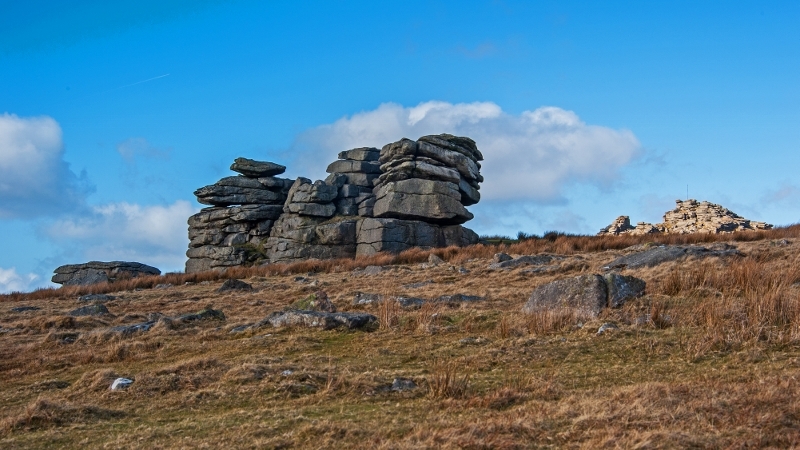 Vixen Tor is one of the few Tors on Dartmoor that is privately owned. 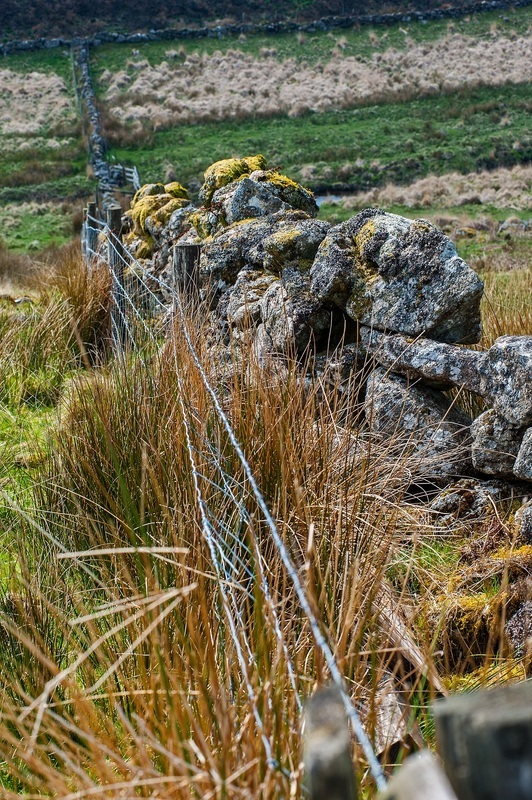 There is a wall around it keeping all visitors out. 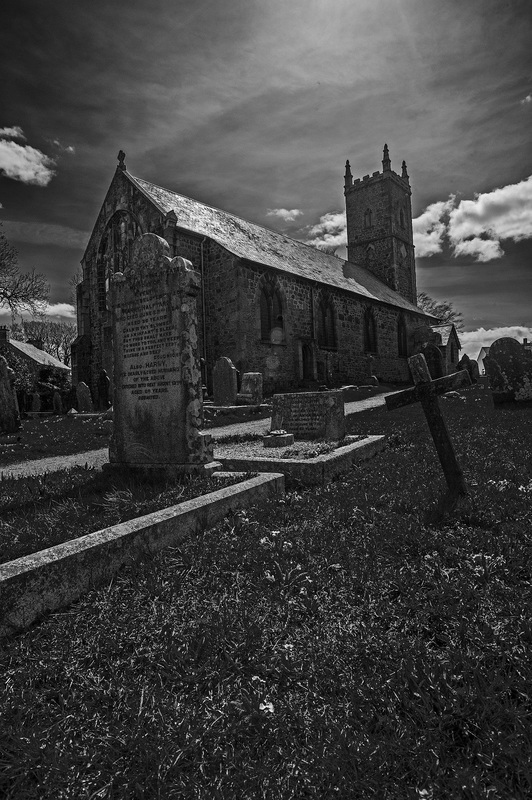 This church was build by American and French prisoners of war after 1812. 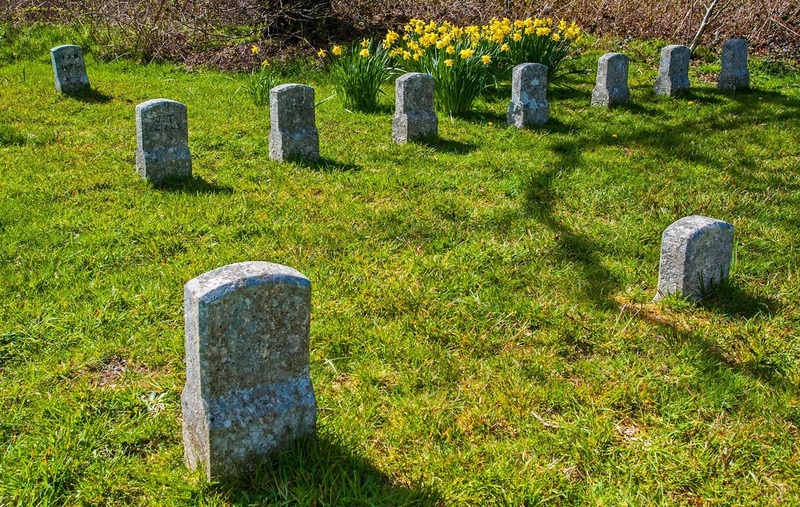 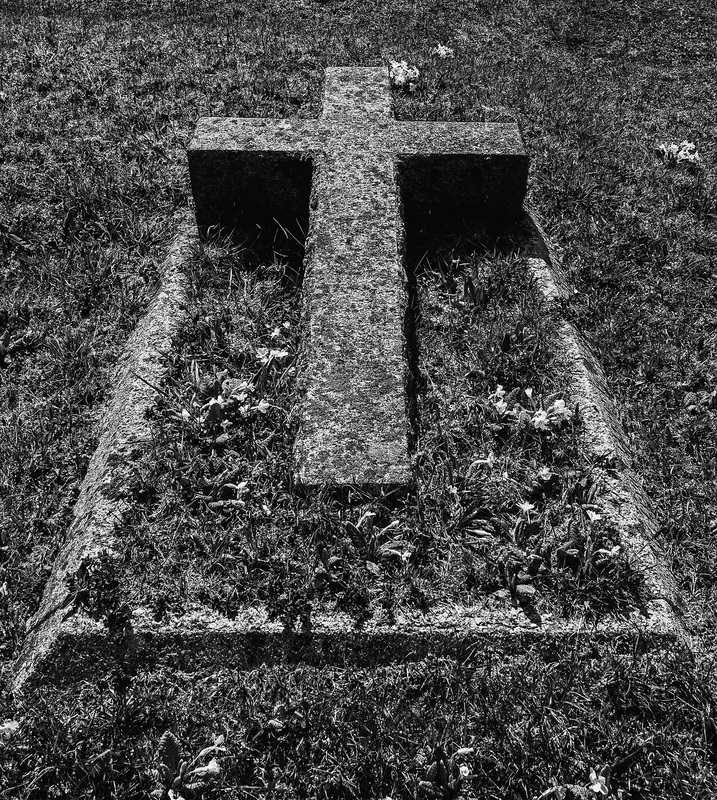 These gravestones marked only with initials may be the graves of Dartmoor Prison inmates or may be pauper's graves. 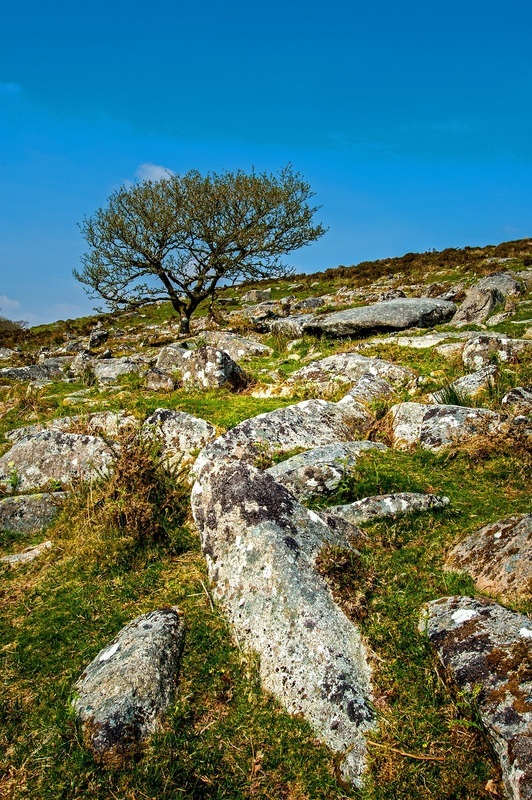 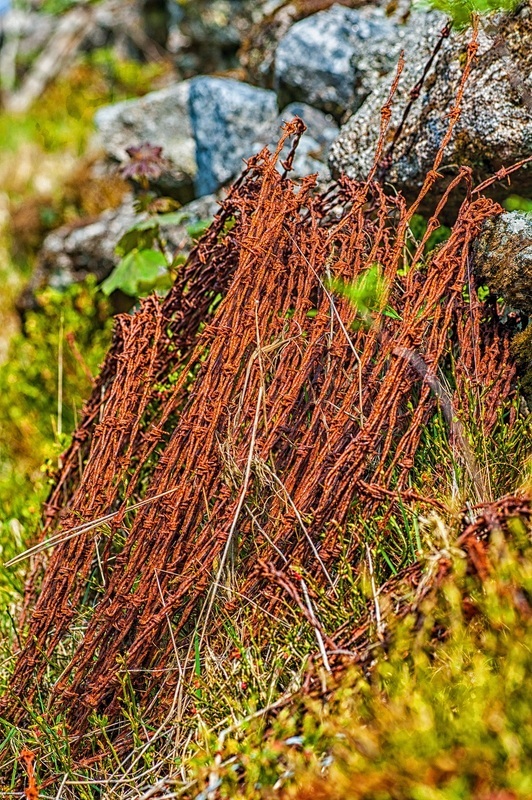 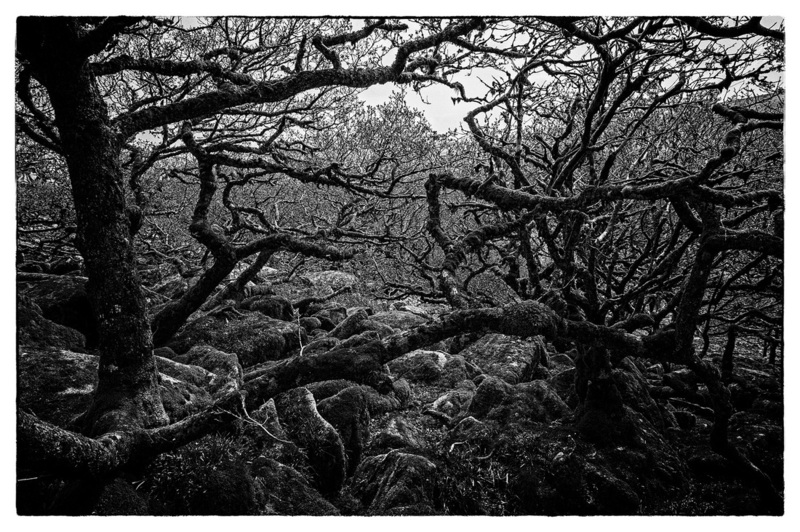 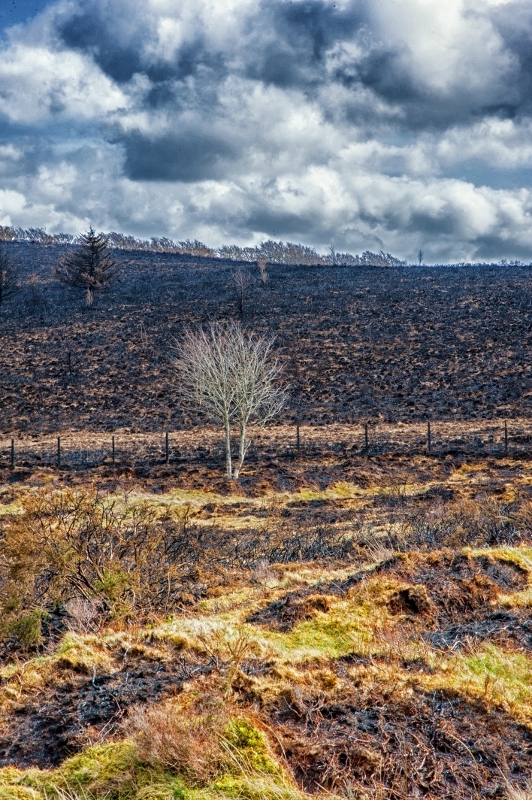 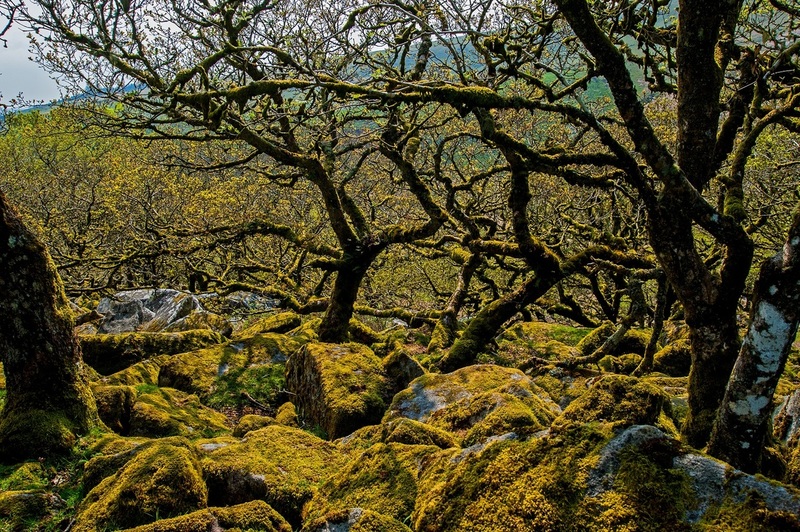 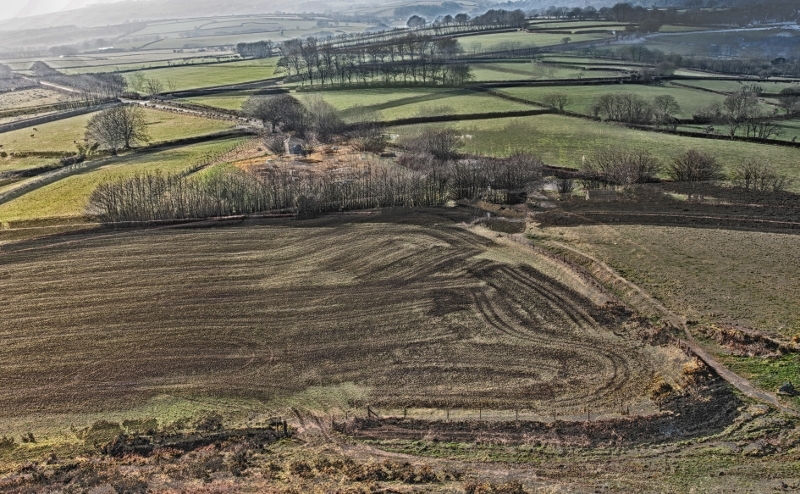 This is one of only three remaining examples of upland woodland in Dartmoor. 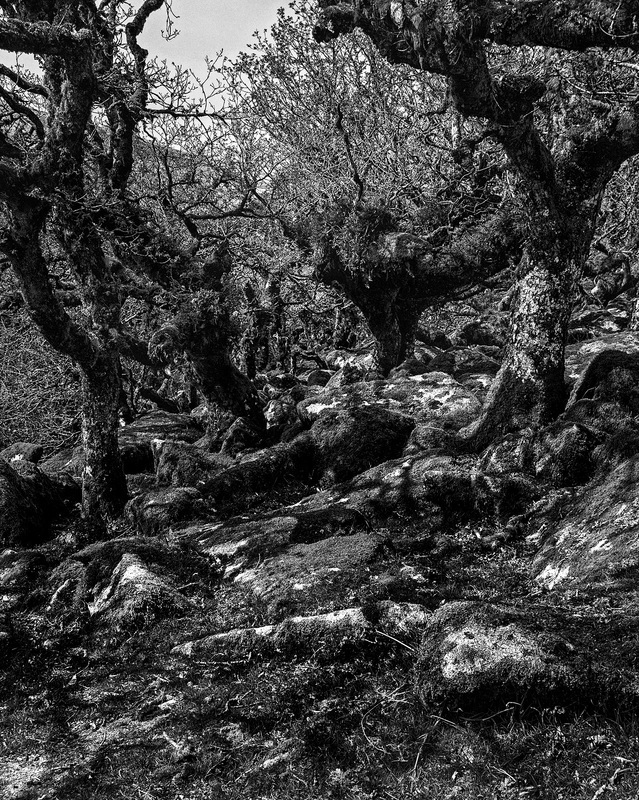 The following photos were taken on the hike from the main road up to the wood and the return walk. 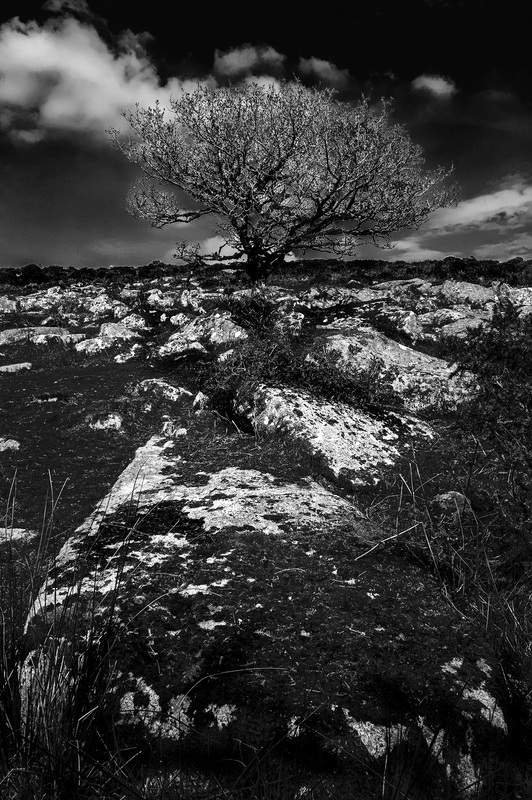 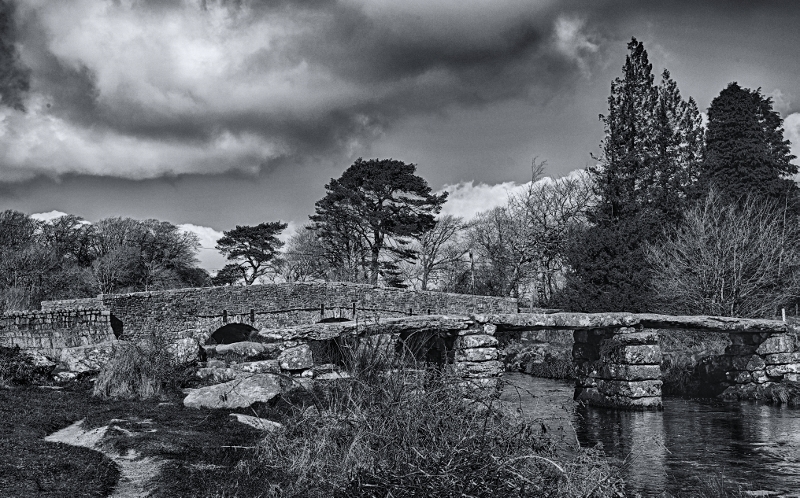 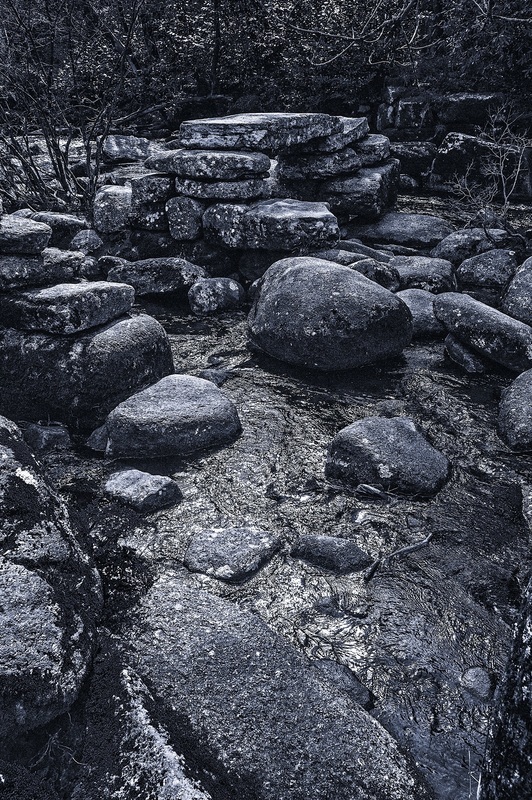 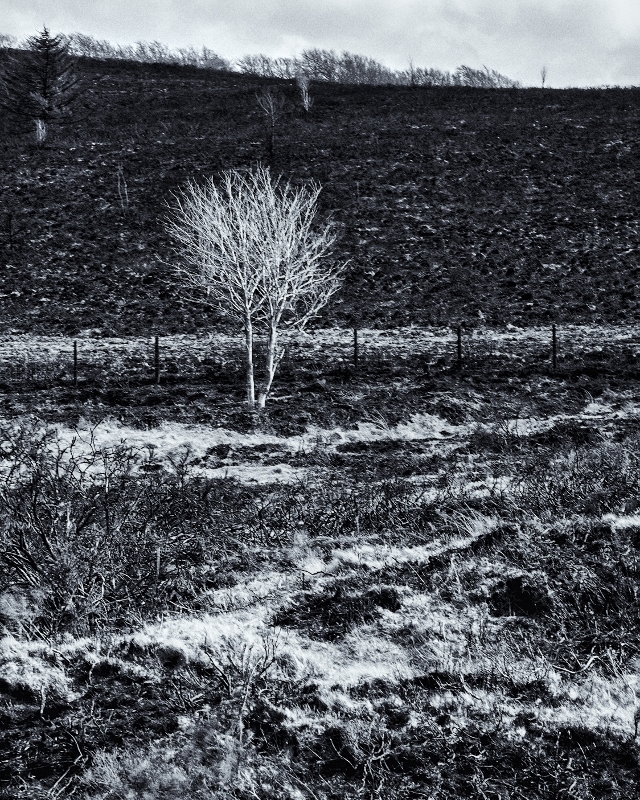 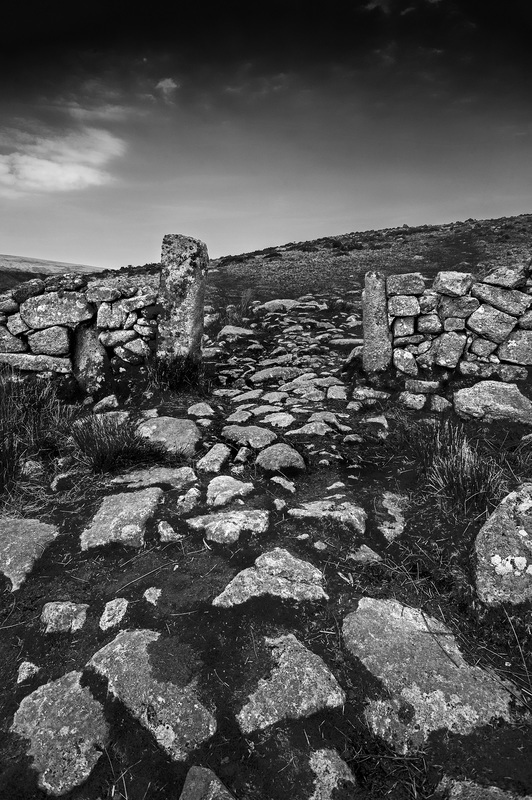 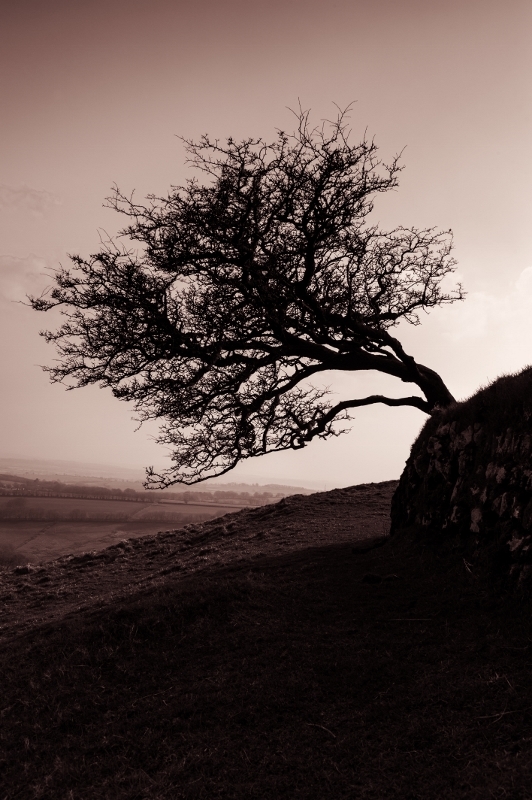 Many photos are in monochrome as I fell it adds to the sense of mystery of the location.